In 2012 the MLA and the American Historical Association (AHA) received grants from the Andrew W. Mellon Foundation in support of parallel initiatives to discover the current occupations of PhD recipients who had completed doctoral study since 1995—the last year humanities graduates were canvassed for the federal government’s Survey of Doctorate Recipients (SDR).1 The AHA and MLA studies used Internet searches to find public information about the current employment of a random sample of graduates. The MLA’s sample included 2,590 doctoral program graduates drawn from a universe defined by Dissertation Abstract International records indexed in the MLA International Bibliography for graduates who earned degrees between 1996 and 2011. A report on the MLA’s research appeared as “Where Are They Now,” a February 2015 post on The Trend. The AHA’s report, “The Many Careers of History PhDs,” was published in spring 2013. In 2018 the AHA published “Where Historians Work,” an online interactive data set that expands its initial research to catalog the career outcomes of 8,515 historians who earned PhDs at universities in the United States between 2004 and 2013. Both AHA resources are available at the Career Diversity Resources page on the AHA Web site. In July 2017 the MLA’s office of research reached out to the 1,949 individuals in the original sample for whom e-mail addresses had been found in 2014 and invited them to complete a survey about their employment since they completed the doctorate. The survey received responses from 310 (15.4%) of these doctorate recipients, as well as from one respondent who was not part of the original sample. The information the 311 respondents provided is illuminating. At the same time, the small number of respondents reminds us how enormously far tracking efforts have to go before the profession can claim to have anything approaching a comprehensive picture of the occupations and employment histories of the nearly 100,000 individuals who, as documented by the Survey of Earned Doctorates, have earned terminal degrees in English and other modern languages since 1960.
in the 2009–15 cohort (23 cases) held tenured positions in 2017. By contrast 54.1% of the 2002–05 cohort (74 cases), 57.1% of the 2006–08 cohort (42 cases), and 69.1% of the 1999–2001 cohort (81 cases) held a tenured faculty position at the time they completed the survey in 2017 (fig. 2). Graduates’ longer-term occupational outcomes and prospects appear to vary significantly with the contingent economic climate prevailing at the time of their initial job search and point of transition from graduate school into the labor force. The information these PhDs provided about their first job placement after graduate school affords insight into the movement from tenure-track and non-tenure-track appointments to tenured faculty status—and from initial placements in academe into occupations beyond postsecondary teaching and administration. Figure 3 shows respondents’ first job placements after graduate school. Comparing figure 3 with figure 2 quantifies how graduates in different cohorts varied less in their initial job placements than in their longer-term occupational destinations, measured as where they were working as of summer 2017. Of the 1999–2001 cohort, which in 2017 had 69.1% of its members in tenured faculty positions, 38.8% were placed to a tenure-track position directly from graduate school; 31.3% and 7.5% had initial placements in full- and part-time non-tenure-track appointments, respectively, which had contracted to 4.9% (both full- and part-time) by 2017. By contrast, of the 2009–15 cohort, which graduated into the very challenging economic and employment climate post-2008, only 26.1% found a tenure-track position directly out of graduate school, and only 39.1% had achieved tenure or a tenure-track appointment by 2017. Of course, the future may bring more movement from non-tenure-track to tenure-track positions for those in this most recently graduated cohort, as it has for three of its four predecessors. Or the future may confirm a more permanent shift to non-tenure-track appointments and to employment outside academe—a shift that is apparent in the data for the 2009–15 cohort to date and that characterizes the experience reflected in the far lower fraction of graduates in tenured and tenure-track positions in the 1996–98 group and the markedly higher 28.9% who have moved out of academe into self-employment or business, government, and nonprofit organizations. The most urgent message of these data may be how important it is for both doctoral programs and their students to remain open and active in consideration of the fullest possible range of employment options and opportunities, especially perhaps if a leading one of those options is the career of a tenured faculty member. A report on all findings from the 2017 survey of doctoral program graduates, including earnings and job satisfaction, is available from the Career Resources page of the MLA Web site.. This entry was posted in Academic workforce, Careers, Graduate study, Occupations, PhD placement on August 28, 2018 by David Laurence. In 2016–17, the downturn in jobs advertised in the MLA Job Information List (JIL) continued for a fifth consecutive year. The JIL’s English edition announced 851 jobs, 102 (10.7%) fewer than in 2015–16; the foreign language edition announced 808 jobs, 110 (12.0%) fewer than in 2015–16. Figure 1 shows the trend lines for the number of jobs announced in each edition across the forty-two years from 1975–76 to 2016–17. The declines of the past five years bring the number of advertised jobs to yet another new low, below the level reached after the severe drop between 2007–08 and 2009–10. The 851 jobs in the English edition for 2016–17 are 249 (22.6%) below the 1,100 advertised in 2009–10. The 808 jobs in the foreign language edition are 214 (20.9%) below the 1,022 advertised in 2009–10. 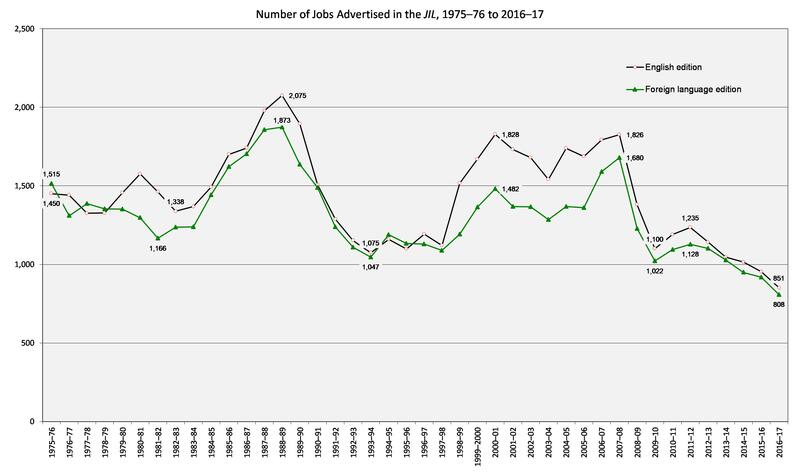 This past year marks the eighth that the number of jobs advertised in the JIL has remained at a trough level, below or just above the historical threshold of 1,000 jobs in each edition. The 2016–17 totals are 975 (53.4%) below and 872 (51.9%) below the 2007–08 prerecession peaks of 1,826 jobs for the English edition and 1,680 jobs for the foreign language edition, respectively. In addition to reading JIL listings to count the number of jobs announced, staff members in the MLA’s office of research perform a machine analysis of the JIL database to develop information on the number and characteristics of the ads departments place. The number of ads is always somewhat smaller than the number of jobs the ads announce, since some ads announce more than one position. In 2016–17 the English edition carried 725 ads from 478 departments in 396 institutions. The 2016–17 foreign language edition carried 750 ads from 521 departments in 354 institutions. (Ads for positions outside postsecondary education are included in these counts.) In the English edition, 66 fewer departments placed ads in 2016–17 than in 2015–16, and the number of ads declined by 98 (11.9%). In the foreign language edition, 32 fewer departments placed ads in 2016–17 than in 2015–16, and the number of ads declined by 87 (10.4%). The 725 ads in the English JIL in 2016–17 are 923 (56.0%) below the 1,648 ads recorded in 2007–08, the recent peak. The 750 ads in the foreign language JIL in 2016–17 are 772 (50.7%) below the 2007–08 peak of 1,522. Since 2007–08, the number of departments placing ads has dropped from well over 900 to under 500 in the English edition and to just over 500 in the foreign language edition. Table 1 shows the number and percentage of ads in the JIL’s English edition, broken out by the index terms for tenure status and rank that advertisers have selected for listings placed since 2007–08. Table 2 shows the equivalent information for listings in the foreign language edition. 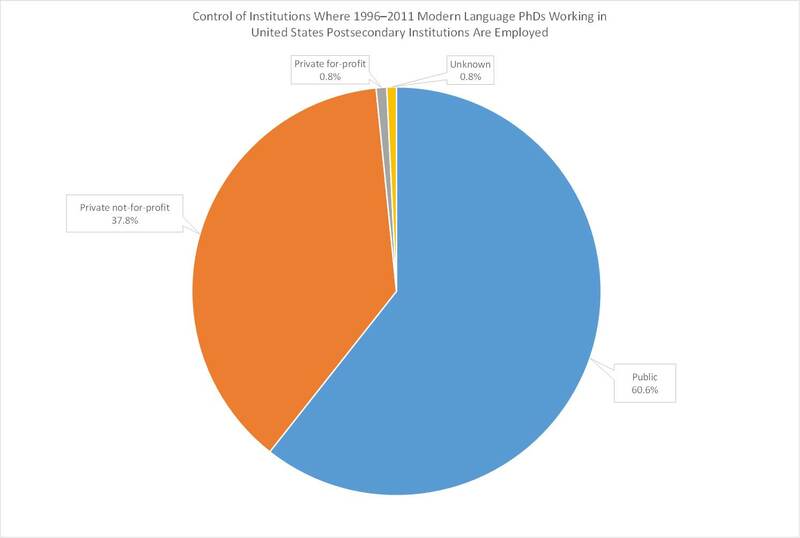 The tables quantify the scale of the contraction in academic job opportunities in English and the other modern languages, especially tenure-track assistant professor positions, that began in 2008–09 and has persisted since. In the English edition, the share of ads for positions classified as tenure-track has fallen to under 65% from about 75%, while the share of ads for positions classified as non-tenure-track has grown to almost 35% from just over 20%. In the foreign language edition, the share of ads for positions classified as tenure-track has fallen from about 60% to just over 45%, while the share of ads for positions classified as non-tenure-track has grown from about 35% to over 50%. A full report on the 2016–17 JIL and trends in the ads will be published later this year. This entry was posted in Academic workforce, Careers, Graduate study, PhD placement, The job search, Uncategorized on October 17, 2017 by David Laurence. How to promote the value of study in the humanities and how to give a convincing public account of the benefit an undergraduate might expect to receive from majoring in a humanities discipline have been perennial questions for academic humanists and humanities departments. Both questions gained urgency after 2009, when programs began seeing declines—in some cases reportedly precipitous—in the number of undergraduates declaring a humanities major. The anecdotal reports were connected to currently enrolled undergraduates. But they foretold declines that appeared two or three years later in the systematic degree completions data that the federal government collects as part of the Integrated Postsecondary Education Data System (IPEDS). As made available on the National Science Foundation’s WebCASPAR site, IPEDS degree completions show steep downturns in English and history since 2012, following a long period of relative stability through the 1990s and early 2000s. The other core humanities disciplines—languages other than English and philosophy and religious studies—saw similar, if less dramatic, declines (fig. 1). 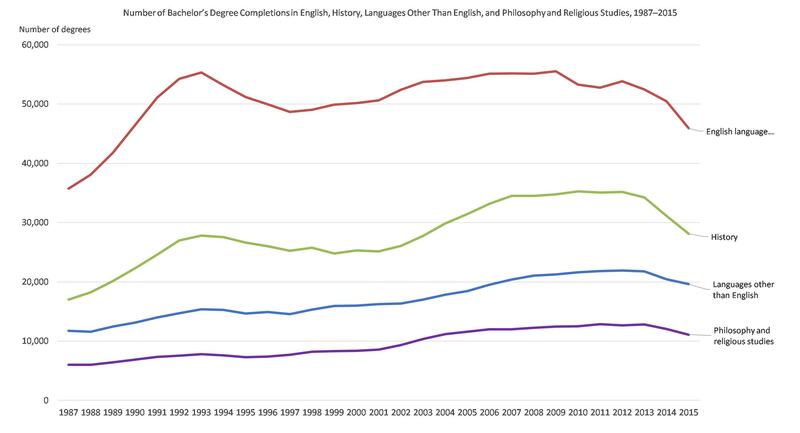 The recent decline has eroded 48.6% of the increase in bachelor’s degrees English saw after 1987 and 39.3%, 22.2%, and 25.6% of the increases that history, languages other than English, and philosophy and religious studies, respectively, saw until as recently as 2012. Figure 1 shows a twenty-nine-year span of data back to 1987, the year the United States Department of Education introduced the Classification of Instructional Programs, which categorized the fields of study in which institutions confer degrees with greater detail than before. (In the Department of Education’s pre-1987 field categorization, philosophy and religious studies was not broken out as a separate discipline, but included in “other humanities.”) Figure 2, which includes data going back to 1966, shows that the current decline, measured in absolute numbers, is—as of 2015—still modest compared with the decline in degree completions that English and history experienced in the 1970s. 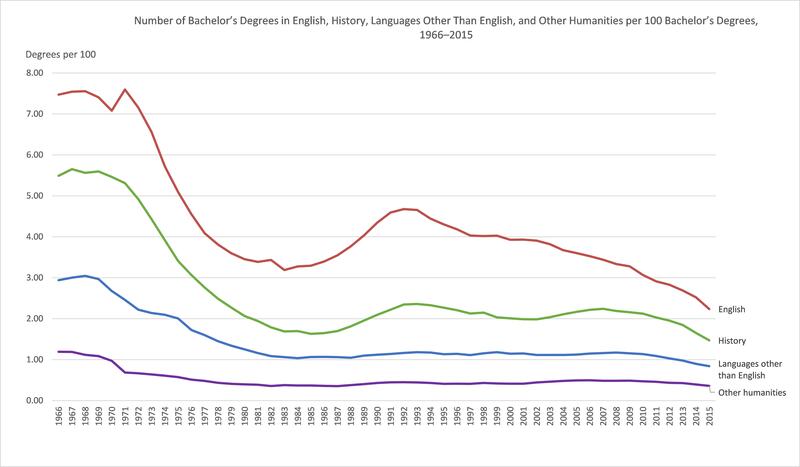 In relative terms, however, as a share of all bachelor’s degree completions, the humanities fields stand near or below the lows reached in the 1980s. English has seen its share erode steadily since 1993, falling to 2.24 of every 100 bachelor’s degrees in 2015, considerably below its prior low point of 3.19, reached in 1983. History has fallen to 1.47 of every 100, also below its prior low point, 1.63, reached in 1985 (fig. 3). 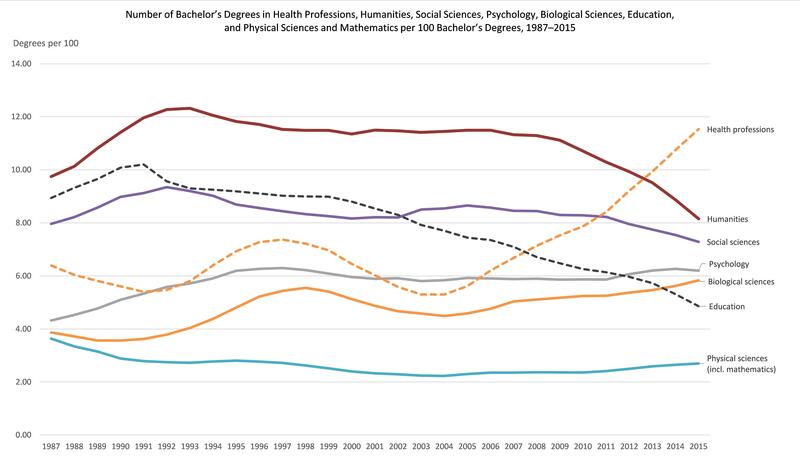 between the humanities and biological sciences in the number of bachelor’s degrees per 100 awarded in each field shrank by almost two-thirds, from 6.7 degrees per 100 in 2006 to 2.3 degrees per 100 in 2015. With the exception of the physical sciences, in 2015 the arts and sciences disciplines claimed shares of bachelor’s degree completions that are far closer to one another than they had been even as recently as 2008. But this redistribution of bachelor’s degree awards within the liberal arts and sciences pales in comparison with changes occurring in professional fields that have clearer ties to specific occupations. 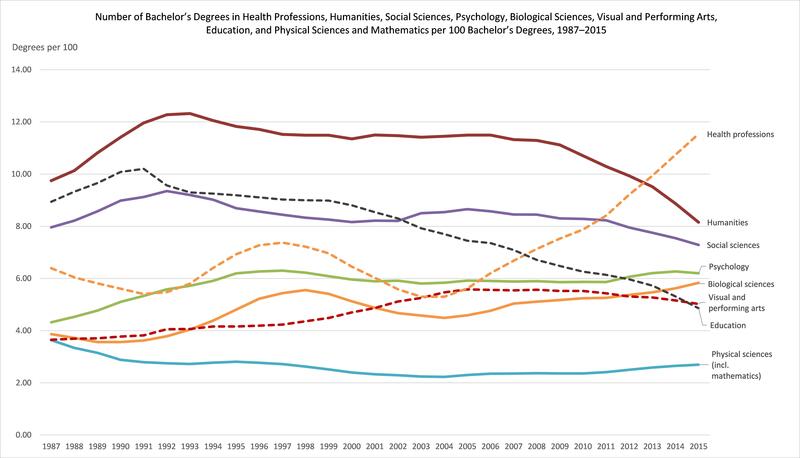 Most striking is the astonishing growth in bachelor’s degrees conferred in health professions since 2004. From 1987 to 2004, health professions conferred 6.2 of every 100 bachelor’s degrees, on average. After 2004, that share grew sharply, to 8.3 of every 100 bachelor’s degrees, on average, for the years 2005 to 2015 (fig. 5). Of equal moment is the flow of students out of education, which over the eighteen years from 1987 to 2004 conferred, on average, 9.1 of every 100 bachelor’s degrees; that number shrank to 6.3 of every 100, on average, for the eleven years from 2005 to 2015 (fig. 6). By 2015, education had fallen to under 5.0 of every 100 bachelor’s degrees, and health professions had grown to over 11.5 of every 100 bachelor’s degrees. 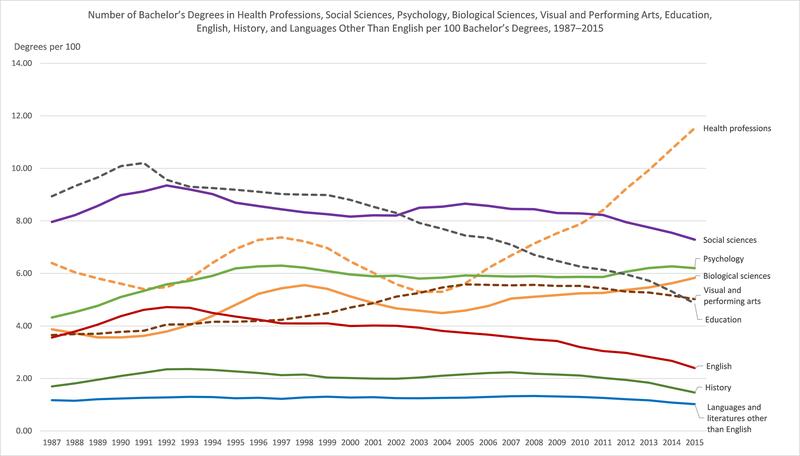 From 1987 to 2006 visual and performing arts saw its share of bachelor’s degrees grow steadily, and it has largely sustained its position since 2006 (fig. 7). Some degree programs categorized under visual and performing arts clearly belong to the academic humanities (art history and film studies, for example). Others signal student interest in hands-on creative work that results in tangible products or performances, whether with a professional aspiration or as a personal avocation (visual and performing arts includes degree programs in acting; dance; music performance; photography and cinematography; and studio arts and painting, sculpture, printmaking, ceramics, metal arts, and weaving). Student interest in these programs in the arts surely shares something in common with the appeal of creative writing that many English departments report draws students to the English major now. 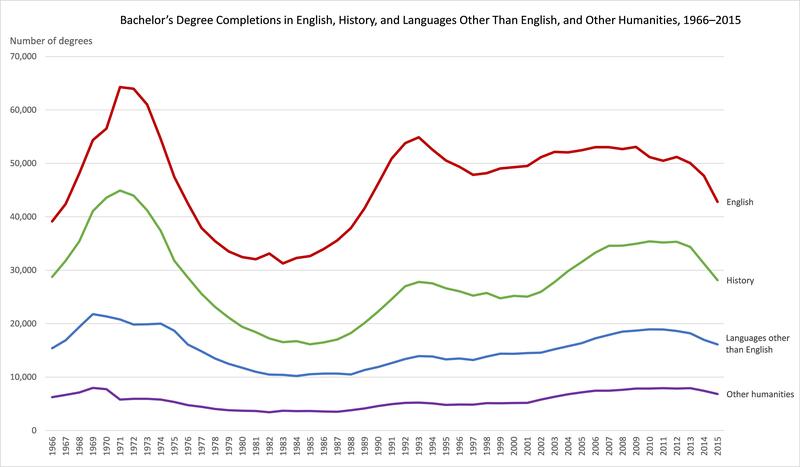 Figure 8 breaks out English, history, and languages other than English to facilitate comparison of trends in the share of degree completions for these humanities fields with those for the six other areas of study that are the focus of this post. The parallel trend lines for English and education may be related, given the historic ties between the undergraduate English major and student aspirations to careers in secondary school teaching. This conjecture returns us to the questions we began with: How do we make the case for the wide-ranging benefits study in the humanities offers for students’ lives and career prospects? And what terms do we use to refocus public discourse on the contributions a humanities education makes to the greater social good as well as to students’ individual economic and career success? To address these questions, we might start in the classroom, encouraging students to reflect with intention on how the academic work they are doing today is exercising capabilities that will serve them well tomorrow, both in their working lives and as citizens. The National Science Foundation’s WebCASPAR Web site provides easy access to time-series data on degree completions, compiled from the degree completions component of the United States Department of Education’s IPEDS survey series. The WebCASPAR interface allows users to specify a wide range of variables and levels of granularity, from degree levels (associate to doctorate) to individual institutions or groups of institutions to national data in the aggregate. WebCASPAR completions totals include United States territories and outlying areas along with the fifty states and the District of Columbia. The figures in this post were created by the author from queries to WebCASPAR that asked for bachelor’s degree completions from 1987 to 2015 by two-digit CIP code and for bachelor’s degree completions from 1966 to 2015 by detailed academic discipline. Derivative calculations, such as the number of degrees per 100, are the author’s. This entry was posted in Bachelor's degrees on June 26, 2017 by David Laurence. The National Science Foundation has released data tables for the 2015 Survey of Earned Doctorates (SED), the federal government’s annual census of new graduates from the nation’s research doctoral programs. 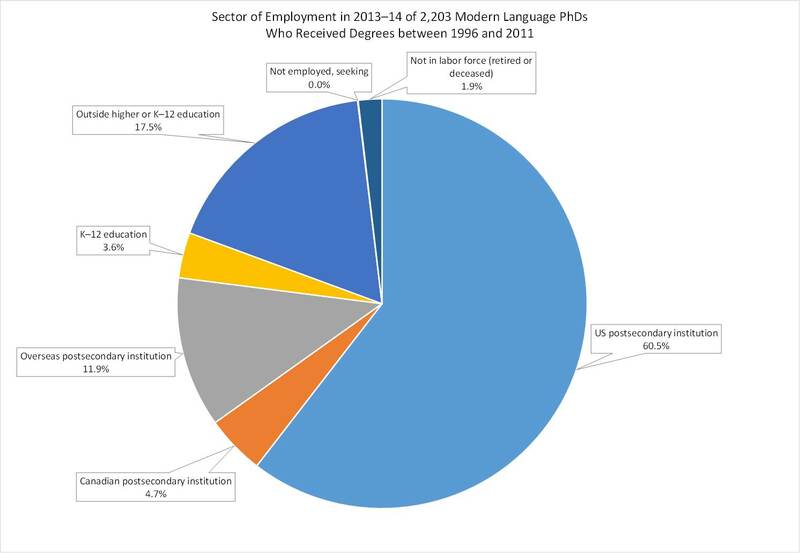 In the academic year 2014–15, modern language programs awarded degrees to 1,281 doctorate recipients in English and to 823 in modern languages other than English. The 1,281 graduates from English doctoral programs comes close to the recent high of 1,286, reached in 2012. 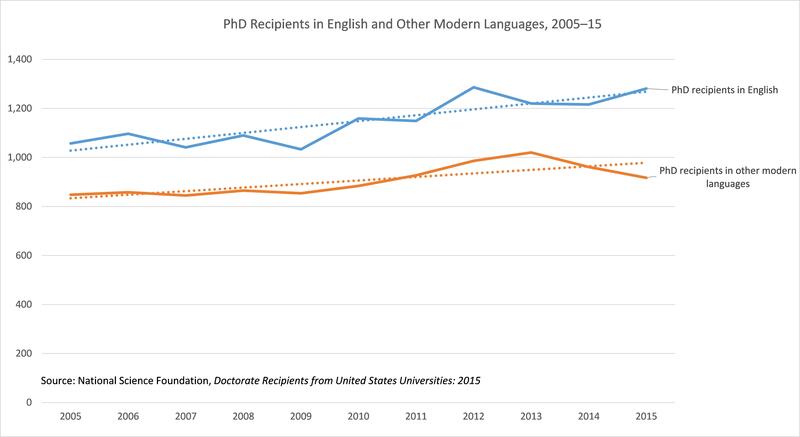 While the 823 graduates from doctoral programs in other modern languages is substantially below the recent high of 919 reached in 2013, there has been an upward trend in the production of PhDs in both English and other modern languages over the eleven-year period 2005–15 (fig. 1). The increases since 2009 are particularly concerning, given the severe contraction of entry-level professorial rank positions that has marked the same years. 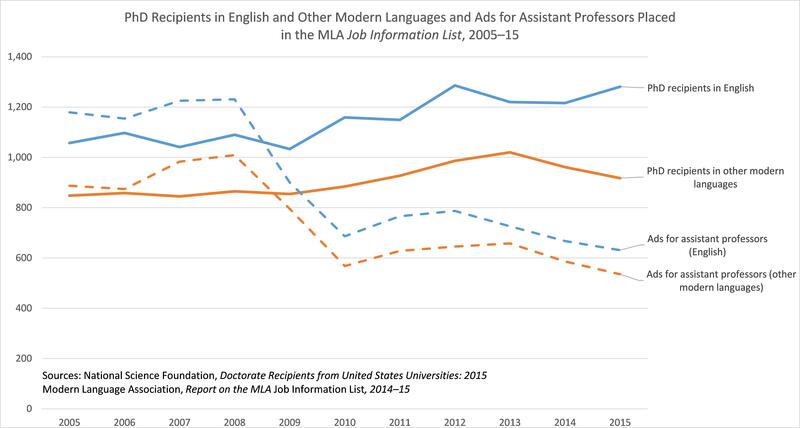 Figure 2 shows the SED counts for PhD recipients in English and other modern languages from 2005 to 2015 against the trend lines for ads for full-time assistant professors in the MLA Job Information List over the same years. Over the six years 2010–15, PhD production in English has averaged 14.6% higher than the average for the previous five years, 2005–09, while ads for assistant professors have averaged 37.6% fewer. 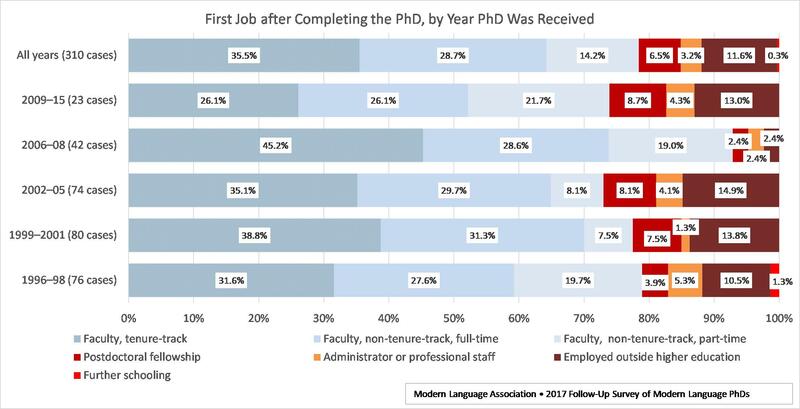 In other modern languages, the number of doctorate recipients averaged 11.1% higher over the six years 2010–15, while ads for assistant professors averaged 33.7% fewer. The contrary trends in PhD production and academic job opportunities suggest that programs and the profession must return yet again to the question of graduate student enrollment and the size of doctoral programs. 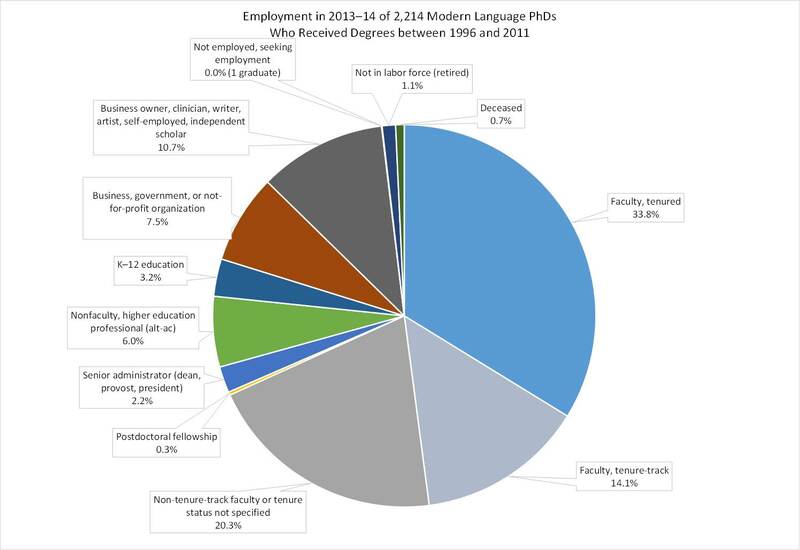 The national aggregate of modern language PhD recipients represents aspirations and decisions accumulated across English and other language programs in the 162 universities that awarded degrees in letters and the 86 that awarded degrees in other modern languages in 2014–15, as shown in SED table 8. The institution-by-institution enumeration underscores the critical importance of institution- and program-level tracking of the employment outcomes and career paths of students who undertake doctoral study. The question of program size can only by addressed locally and hinges largely on how readily program graduates find their way to economically sustaining careers, whether in academia, in secondary schools, or in business, government, or nonprofit organizations. We have extracted the SED enumeration of degree recipients in letters and foreign languages from table 8 and placed the data in a spreadsheet that lists the institutions according to the number of PhD recipients they graduated in 2015. Note: The MLA counts of graduates in English and other modern language doctoral programs are drawn from table 13 in the set of 72 data tables for the 2015 SED. The MLA counts reconfigure the subfields that the NSF aggregates under “letters” and “foreign languages and literatures.” To count PhDs in English, we aggregate six of the eleven SED subfields that make up the NSF’s “letters” category—English language; English literature, British and Commonwealth; American literature, United States and Canada; creative writing (initiated in 2007); rhetoric and composition (initiated in 2012); and speech and rhetorical studies. Our count for “other modern languages” includes comparative literature (which the NSF places in letters), along with the eleven subfields that make up the NSF aggregate “foreign languages and literatures”—Arabic, Chinese, French, Germanic, Italian, Japanese, Latin American, Russian, Slavic, Spanish, and other foreign languages. Omitted from our count for modern languages is classics, which the NSF counts under letters. The NSF categories and the subfields and degree recipients counted under each category are shown in SED table 13. We have extracted the section of table 13 that covers humanities and arts subfields and placed the data in a spreadsheet that enumerates degree recipients by subfield across the eleven years 2005–15. This entry was posted in Graduate study on February 6, 2017 by David Laurence. MLA members have long been attentive to United States Department of Education data that document the decreasing fraction of higher education faculty members who hold tenured and tenure-track appointments and the emergence of a faculty majority that delivers instruction through non-tenure-track, especially part-time, positions. Analysis has generally focused on the faculty as the unit of observation, considered apart from other categories of higher education employees. 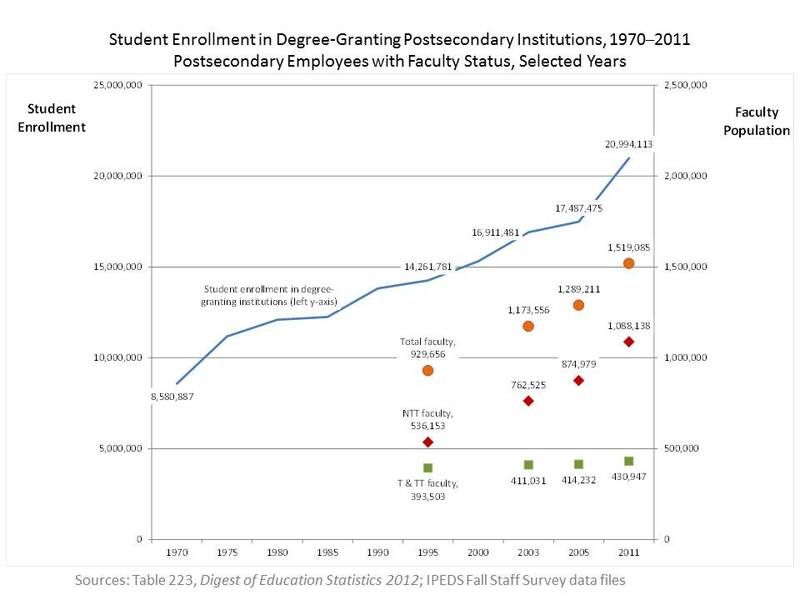 Department of Education data collected for fall 2014, for example, enumerate a faculty workforce of 1,569,207 in two- and four-year Title IV–participating United States colleges and universities—plus an additional 368,378 graduate student assistants (Ginder et al., 10–11 [table 3]). Of the 1.57 million faculty members, only 27.2% held tenure or were on the tenure track; 52.9% had part-time and 19.4% full-time temporary appointments with no eligibility for tenure. The first two conclusions may strike some readers as paradoxical. The third arguably runs counter to data Hinrichs himself presents and results from the decision he makes about which IPEDS occupational categories to count when considering popular claims concerning “the proliferation of administrators.” He focuses on employees in the “executive, administrative, and managerial” category. But, in one of the most illuminating parts of his analysis, he documents the striking increase in the share of employees—most of them full-time employees—in the IPEDS category “support and service professionals.” As Hinrichs notes, the category covers a broad range of professional positions. Many, such as librarians or legal staff, require advanced degrees. All are exclusive of and nonoverlapping with employees the IPEDS counts in either the “executive, administrative, or managerial” occupational category or the category “faculty” with delivery of instruction as its primary job responsibility. In a trend analysis of IPEDS data for four-year institutions, Hinrichs shows that over the period from 1987 to 2011 the share of full-time employees claimed by the “support and service professionals” category grew by a whopping 50%, from about 20% to about 30% of all full-time higher education employees, while the faculty’s share remained unchanged. But when he concludes that the results of his study do not support popular beliefs about the proliferation of administrators, he sets to one side the “support and service professionals” group, restricting his attention to the “executive, administrator, and managerial” category, which (as he also shows) claimed only a modestly larger share of employees in 2011 than it had in 1987. The problem that analysis confronts here is not so much the technical one of deciding which higher education jobs rightly fall in the IPEDS’ administrator job category as the rather messier one that follows from asking what jobs the collective popular discussion has in mind when it points to a proliferation of administrators. To better understand the contribution Hinrichs makes to the ongoing discussion of adjunct labor and the changing academic workforce, the MLA office of research went back to the IPEDS data files to replicate, and also build on, his results and charts. The following discussion and accompanying figures are based on files for two IPEDS human resources components from three specimen years—the 1995 Fall Staff Survey and the Employees by Assigned Position Survey (EAP) for 2005 and 2011. (The data files are available to download at https://nces.ed.gov/ipeds/datacenter/DataFiles.aspx.) The 1995 Fall Staff Survey was chosen because it was the first of the IPEDS survey series to permit analysis of the faculty by tenure status as well as by full- and part-time employment status. We use the EAP survey (introduced as an IPEDS component in 2003) because it permits analysis of employees by faculty status, full- and part-time employment status, and tenure status across the three occupational categories of faculty, administrators, and support and service professionals. The EAP and fall staff surveys cover the same institutional universe and (with some minor discrepancies) produce the same quantitative results. 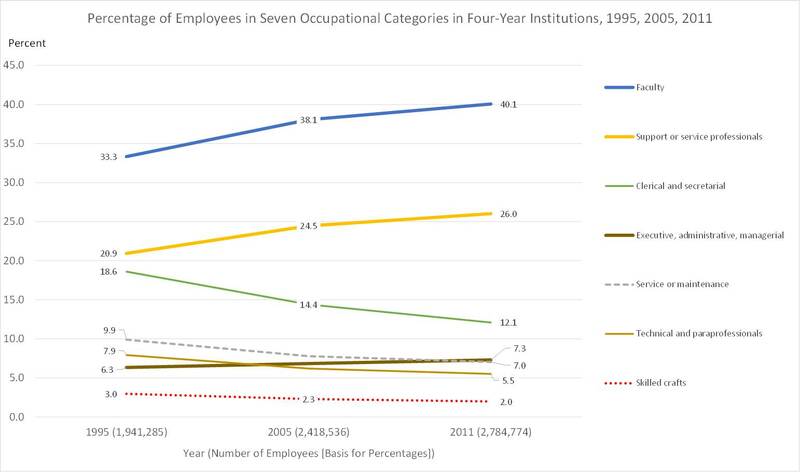 Figure 1, for example, shows the percentage of institutional employees in each of the seven IPEDS occupational categories in 1995, 2005, and 2011; it replicates results shown in the first figure of Hinrichs’s commentary, which is based on fall staff survey files for the thirteen odd-numbered years from 1987 to 2011. The MLA figure and Hinrichs’s both depict what Hinrichs terms the occupational mix—that is, the percentage of all employees claimed by each of the seven IPEDS occupational categories. The trend lines for 1995, 2005, and 2011 match those Hinrichs’s figure shows for 1987–2011, despite the differences in IPEDS components and in temporal coverage. The institutional universe for both Hinrichs’s analysis and the MLA analysis is limited to degree-granting, Title IV–participating four-year colleges and universities in the fifty states and the District of Columbia; two-year colleges are not included. As Hinrichs notes, and as figure 1 shows, two occupational categories—the faculty and support or service professionals—claim the largest percentage shares and grew the most in comparison with the other categories. 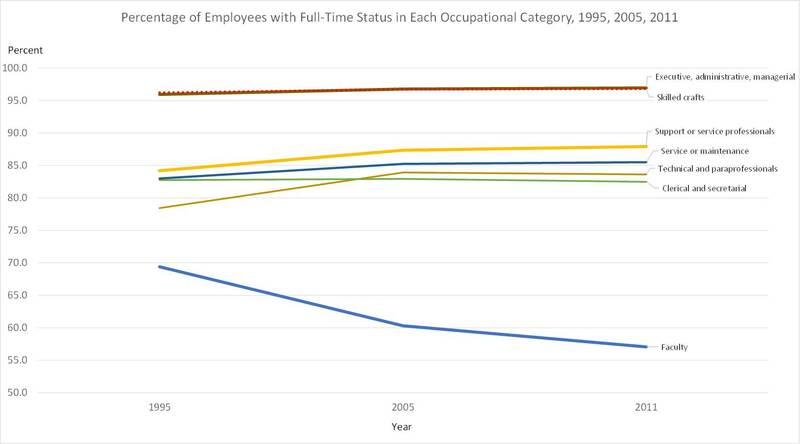 Of greater significance are trends that become visible when the data are filtered to show the percentage of employees inside each occupational category that have full-time positions (fig. 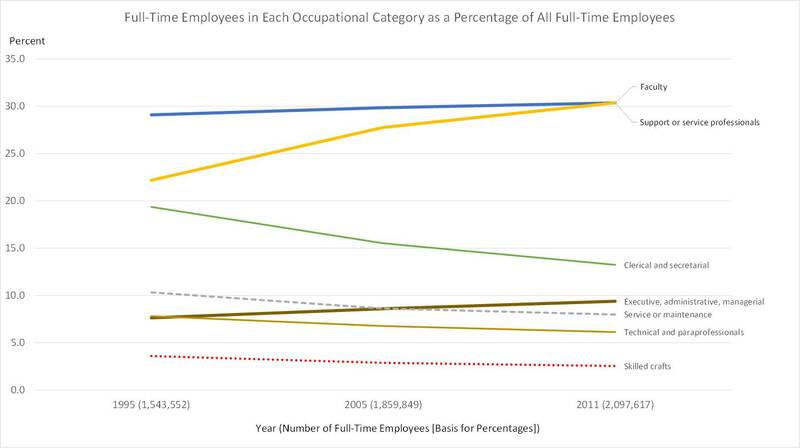 2) and the share of all full-time employees claimed by full-time employees in each of the seven occupational categories (fig. 3). To calculate the first, the number of full-time employees in each category is divided by the total number of employees in that category; to calculate the second, the number of full-time employees in each category is divided by the total number of full-time employees across all seven categories. The really striking development Hinrichs calls attention to is how only the faculty saw a sharp drop in its full-time members (fig. 2). In every one of the other categories, 80% or more held full-time jobs in 2011, and the share of full-time employees inside each category either held steady or increased over the period. 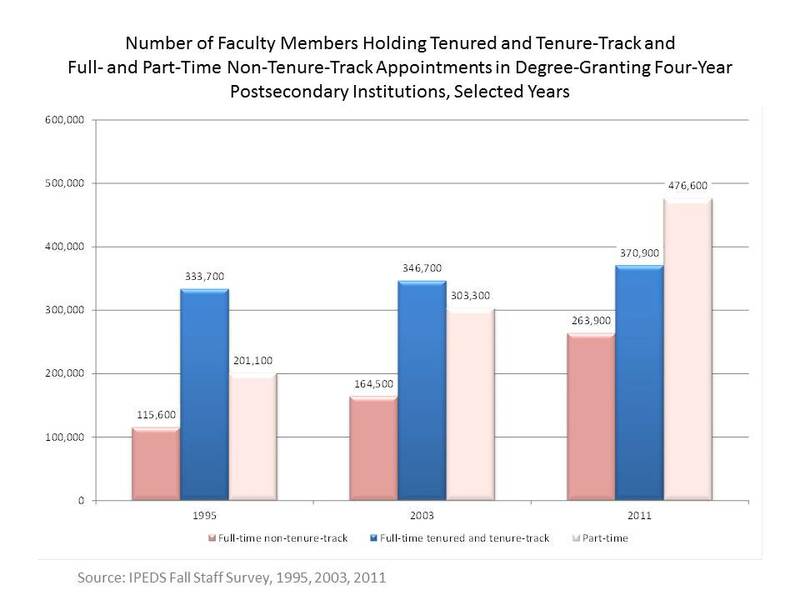 By contrast, in 2011 the portion of the faculty in full-time positions had fallen to under 60%. 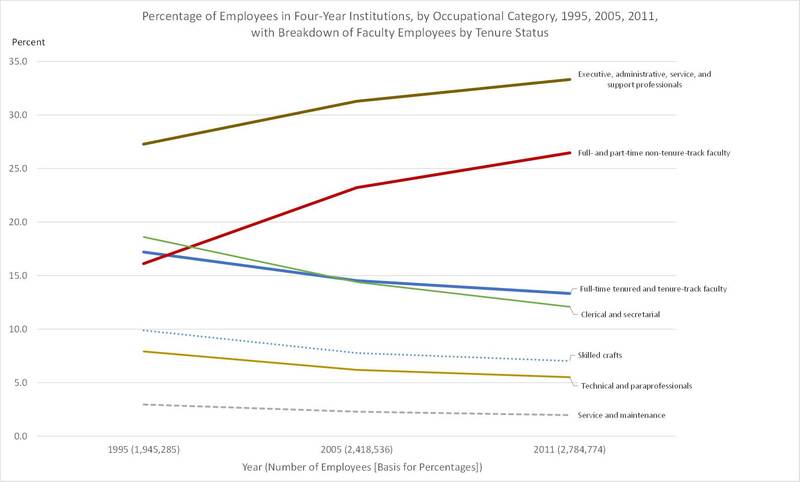 Figure 2 shows these trends and the growing disparity between the faculty and the other six occupational categories. But, as shown in figure 3, the faculty’s share of all full-time employees remained largely unchanged, while professionals in the support and service category increased their share more than any other group. 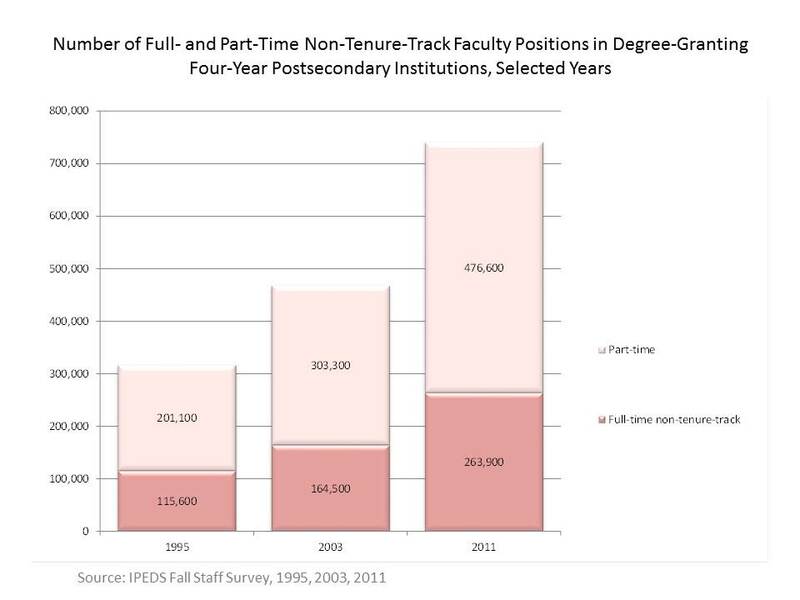 Figure 2 reflects the enormous growth of part-time positions inside the faculty category; figure 3 reflects the rapid growth in the number of nonteaching professionals in full-time jobs compared with the number of full-time faculty positions, where the trend line indicates growth that barely outpaced the increase in all full-time institutional employees. Hinrichs’s exploration of employment trends in higher education is confined to an analysis of changes in the mix of full- and part-time employees in four-year institutions. Hinrichs does not discuss tenure status or the declining standing of the tenure-line faculty in higher education—which is the trend that defines the critical issue for the academic professions and for the prospects of students in doctoral programs who aspire to academic careers. Figure 4 adds the dimension of tenure, separating the segment of the faculty that holds full-time tenured and tenure-track appointments from the segment that holds full- or part-time non-tenure-track positions. The figure also combines the two IPEDS occupational categories “executive, administrative, and managerial” professionals and “support and service professionals.” Aggregating the executive and support groups and separating the tenure-track from the non-tenure-track faculty makes vividly apparent how nonteaching professionals and non-tenure-track faculty members are the only categories that have enlarged their share of the employee mix. The growth in these categories of professional employees stands in stark contrast to the declining fraction of employees in the full-time tenured and tenure-track faculty category. In more than a few cases or contexts, there may be good reason to label the increased share of college and university personnel employed as nonteaching professionals pejoratively, as administrative bloat. For the purposes of argument, however, let’s grant the importance of many nonteaching professional positions and the positive contributions these colleagues make to institutional life. After all, some of these colleagues may be degree recipients from our own graduate programs—hardly a surprise given how much of the job growth in higher education, especially full-time jobs, has come in the form of nonteaching professional positions. Pointed questions still wait for answers, however—about institutional policies and practices that, unlike with every other category of college and university personnel, have undermined the stability of the faculty through the massive use of part-time appointments and that have signally failed to maintain full-time employment with a presumption of permanence and the opportunity for advancement through rank as normative for faculty positions (and faculty careers and career paths). Between 1995 and 2011, the faculty in four-year colleges and universities grew by nearly 470,000, or 72.4%, while nonteaching professionals grew by nearly 400,000, or 75.2%. But of the faculty positions added, nine of every ten were non-tenure-track and nearly six of every ten were part-time; of the nonteaching professional positions, more than nine of every ten added was full-time (fig. 5). A recent study conducted for the Council of Independent Colleges found significant, institutionally problematic disparities between the segments of the faculty eligible and not eligible for tenure—in the character and consistency of the institutional policies, practices, and standards governing hiring, compensation, evaluation and review, professional development, support and recognition for continuing scholarly activity, and opportunities for advancement (Morphew et al.). And data from the 2004 National Study of Postsecondary Faculty (NSOPF:04) tell us that tenure-line and non-tenure-line faculty members differ markedly in their degree qualifications. In four-year colleges and universities, over 80% of faculty members who have tenure or are on the tenure track hold a doctoral degree. 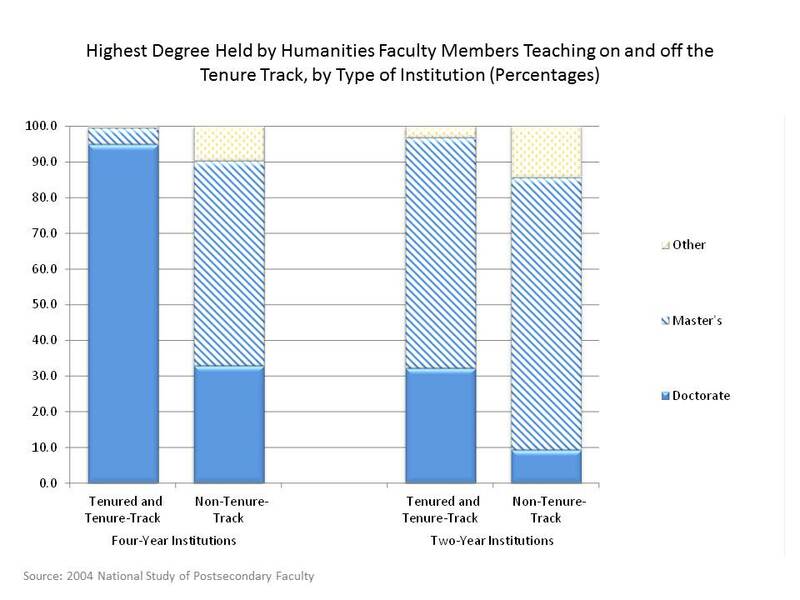 Off the tenure track in four-year institutions, only 30.2% of full- and part-time faculty members hold a doctorate—40.5% of non-tenure-track faculty members with full-time teaching appointments and only 23.7% of those teaching part-time. 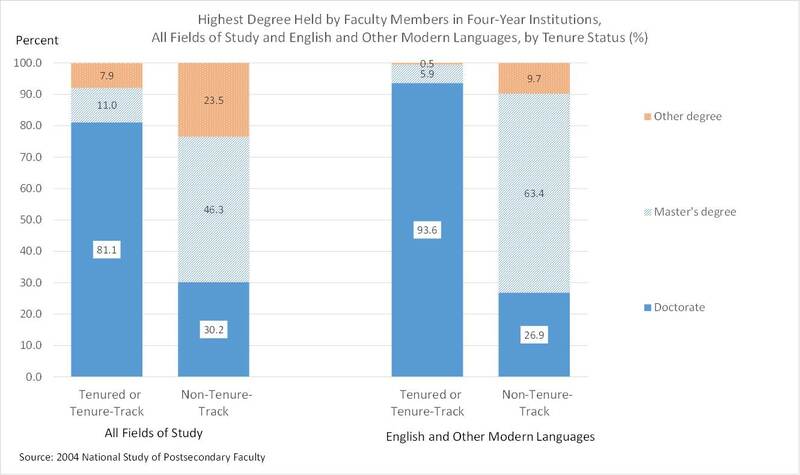 The disparity in degree qualifications is even larger for faculty members in English and other modern languages—NSOPF:04 data indicate that in four-year institutions 93.6% of tenure-line faculty members in these fields hold doctorates, compared with only 26.9% of non-tenure-line faculty members (fig. 6). Discussion of the motivations that direct the teaching preferences of tenured and tenure-track faculty members is of long standing and will continue, as will debates about scholarship and teaching, especially undergraduate teaching, and the place that scholarly publication, and scholarly teaching, hold and ought to hold in the criteria and incentives embedded in higher education’s reward system and in the institutional processes and standards governing the hiring of tenure-track teachers and their promotion through the professorial ranks. Whatever the positions taken or the arguments advanced, restoring equity with other categories of higher education employees in full-time employment and reversing the contraction of the permanent faculty and the expansion of the precariat within the mix of college and university employees must be recognized as steps necessary to healing the breach that institutional policy and practice have created between a minority class of tenure-line faculty members whose continuing employment rests on scholarly expertise expressed as publication and a majority employed to teach and only teach, with little or no institutional expectation, support, recognition, or reward for their continued scholarly engagement. Ginder, Scott A., et al. Enrollment and Employees in Postsecondary Institutions, Fall 2014; and Financial Statistics and Academic Libraries, Fiscal Year 2014: First Look (Provisional Data). US Department of Education, National Center for Education Statistics, 25 Nov. 2015, http://nces.ed.gov/pubs2016/2016005.pdf. Hinrichs, Peter L. “Trends in Employment at US Colleges and Universities, 1987–2013.” Economic Commentary, 13 June 2106, www.clevelandfed.org/newsroom-and-events/publications/economic-commentary/2016-economic-commentaries/ec-201605-trends-in-employment-at-us-colleges-and-universities.aspx. Morphew, Christopher, et al. Changes in Faculty Composition at Independent Colleges: A Report for the Council of Independent Colleges. Council of Independent Colleges, June 2016, www.cic.edu/Programs-and-Services/Programs/Documents/CIC-Ward-report.pdf. This entry was posted in Academic workforce, Careers, Occupations on November 17, 2016 by David Laurence. 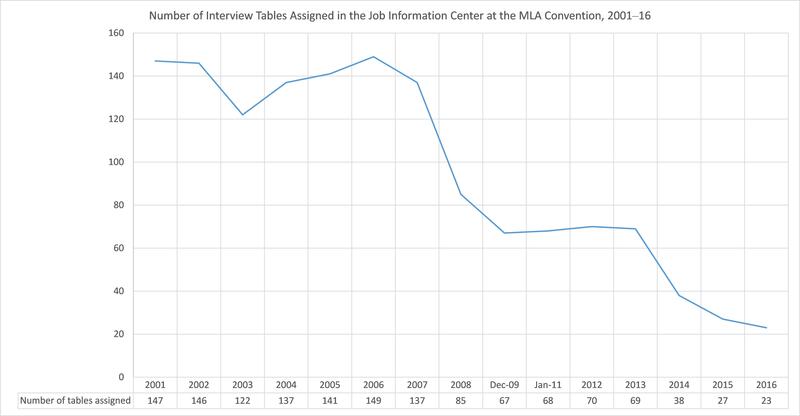 Academic job searches are changing, and long-standing practices connected with interviewing candidates at the MLA convention are clearly changing with them. 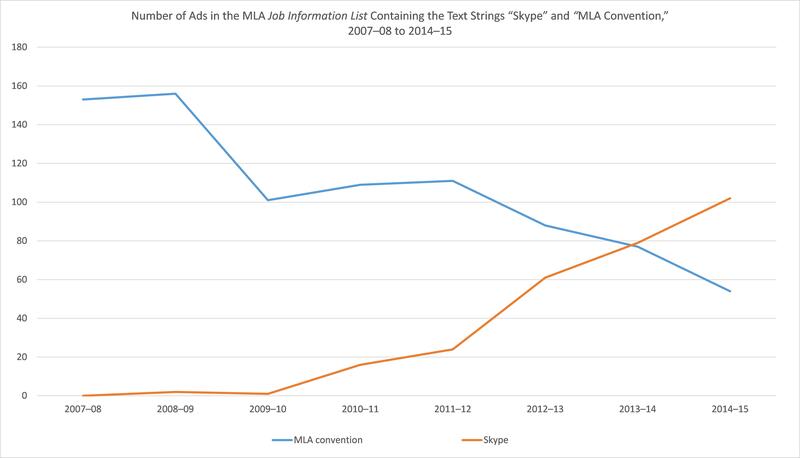 Results from searching for the text strings “Skype” and “MLA convention” in ads that departments have placed in the MLA Job Information List over the past eight years suggest the broad direction of developments (fig. 1). As the number of ads containing the string “Skype” rose from 0 to 102, the number containing the string “MLA convention” fell from 153 to 54. As recently as six years ago, in 2009–10, only a single ad contained the string “Skype” while 101 ads contained the string “MLA convention.” As of this writing in 2015–16, 101 ads contain the string “Skype,” and 56 contain “MLA convention.” Five ads contain both terms—4 of the 5 state that interviews will be conducted either at the convention or by Skype, while the fifth states that interviews will be by Skype and not at the convention. Departments continue to use the convention to schedule interviews. Now that cell phones are becoming ubiquitous personal accessories, however, candidates and departments find it convenient and efficient to use text messaging and voice service to communicate on-site directly rather than through the services the MLA provides in the convention Job Information Center. (The MLA has operated a Job Information Center at the annual convention for decades. Hiring departments use the center by signing in to leave information with members of the MLA staff about the location of convention interviews the departments have scheduled with job candidates. Search-committee chairs can provide advance notice of the names of the hotels where they will be staying to candidates invited for interviews, but chairs and candidates must check in on-site to obtain hotel room numbers.) The result can be seen in the following figures. Over the nine conventions since 2007, the number of departments signing in with the Job Information Center has dropped by 75%, to just over 100 from the 400 to 500 departments that signed in for the seven conventions between 2001 and 2007 (fig. 2). And the number of tables departments use to conduct interviews in the Job Information Center has dropped more than 80%, from about 140 to just 23 at the 2016 convention in Austin, Texas (fig. 3). The much reduced number of departments using the convention Job Information Center obviously reflects the sharp contraction in academic job opportunities and departmental hiring that has occurred since 2008. But it also reflects changes departments are making in the way they conduct searches. The MLA has no stake in maintaining the convention job interview in the face of new technologies that both job seekers and search committees find serve them better, and there is every reason to expect that the use of videoconferencing and teleconferencing for screening interviews will continue to expand. There is also every reason to think that a system where most interviewing takes place by videoconference can restore scholarly exchange and professional development, rather than job interviews, as the convention’s central, defining activities. The MLA seeks to provide services that will improve the job search for hiring departments and above all job seekers. To that end, through its membership committees the association promulgates standards that reflect MLA members’ evolving consensus about good professional practice. In a changing job-search landscape, where new practices are emerging, continuing communications with and among members on all sides of the job search are indispensable to understanding what is happening and how the association can respond in ways that will benefit job seekers and the job search—and also bring about welcome improvements in the experience of attending the convention. This entry was posted in The job search on March 8, 2016 by David Laurence. This post also appears in the Humanities Indicators Data Forum. The Humanities Indicators has published two new reports documenting the effect of gender on the occupations and earnings of humanities majors. The new reports mark a significant addition to the indicators, especially when they are read in relation to one another and to findings from the American Association of University Women (AAUW) on the gender pay gap and from the Georgetown Center for Education and the Workforce on employment and earnings of college graduates. It is worth recalling the data sources that have made it possible to develop these correlations among gender, earnings, occupation, and major field of baccalaureate study: the American Community Survey (ACS) and the Current Population Survey (CPS), both administered by the United States Census Bureau. The current public discussion of the economic value of different college majors stems from a question the Census Bureau added to the ACS in 2009, asking respondents about the major of anyone with a bachelor’s degree living in the households canvassed by the ACS; before 2009, occupations and earnings could be analyzed by level of educational attainment but not by undergraduate field of study. The AAUW’s data on the gender pay gap come from the CPS; administered monthly for the Bureau of Labor Statistics, the CPS is the nation’s primary source of information about the labor force, employment, and earnings. What do these two additions to the Humanities Indicators tell us? The first, on gender and occupations, shows that women proceed from a bachelor’s degree to lower-paid careers in precollegiate education at twice the rate men do and that men are 40% more likely to be in higher-paid management occupations than women. The second, on gender and earnings, shows that, among twenty-four-year-olds to thirty-four-year-olds (or “less experienced workers,” in the reports’ transposition of chronological age into a proxy for postbaccalaureate time in the labor force), women earned $2,000 less than men; this pay gap grows to $17,000 for those between thirty-five and fifty-four (“more experienced workers”). That is, the women in the 24–34 age group earned 4.8% less than the men, or, as this report expresses it following the convention of using the larger (in this case female) population as the base, the men earned 5.0% more than the women. (Presenting the gap both ways may facilitate comparisons, since in most discussions the dollar figure for men serves as the base for calculating the gap in percentage terms.) And among the more experienced workers, in the 35–54 age group, the men with a terminal bachelor’s degree earned 32.7% more than the women; put the other way, the women earned 24.6% less than the men, or 75% of what the men earned. These findings point us to perennial questions about the direction of causality. Do the women earn less because they enter socially valuable but lower-paid professions like teaching? Or are socially valuable occupations like teaching lower paying because women predominately make careers in them? The imbalances in occupations persist for humanities graduates who go on to earn advanced degrees. These reports show that women who earn an advanced degree after earning a humanities bachelor’s degree continue to be employed in precollegiate teaching at twice the rate of men (18.2% of the women compared with 9.2% of the men). The men who hold an advanced degree are 1.7 times more likely to be in legal occupations than the women (17.4% of the men compared with 10.1% of the women). Among holders of advanced degrees in the humanities in the 35–54 age group, the women earn $18,000 less than the men, or earn about 80% of what the men earn. The AAUW’s fall 2015 report, The Simple Truth about the Gender Pay Gap, notes that “in 2014 women working full-time in the United States typically were paid just 79 percent of what men were paid” (3). The Humanities Indicators data on the pay gap, based on a subpopulation disaggregated by both level of education and chronological age as a proxy for level of experience, appear to align with that 79.0% figure, which is based on pay to all women working full-time, regardless of their level of experience or education. The Humanities Indicators data likewise seem aligned with the gender pay gap for graduates in all age groups with terminal bachelor’s degrees in humanities and liberal arts—$7,000—that the Georgetown Center for Education and the Workforce cites in What’s It Worth? The Economic Value of College Majors (2011), the first of its series of reports on earnings of college graduates, broken out by disciplines (136). In percentage terms, a $7,000 gender pay gap corresponds with women earning 86.0% of what men earn. That 86.0% figure makes sense in relation to the figures from the Humanities Indicators and the 79.0% figure from the AAUW report, given that the Georgetown Center reports lump together less and more experienced members of the workforce but exclude those who hold degrees beyond the BA. The two new Humanities Indicators reports let us see how disparities in occupations and earnings that the Georgetown Center studies have documented between the humanities and other fields also appear within the humanities. All these reports prompt important questions about the way gender inflects the choices individuals make at critical junctures of their lives and the degree to which personal agency or the power of social roles and institutions holds sway in motivating and determining what end up being called our personal choices. Visitors to the Humanities Indicators may find themselves wondering whether to adopt the optimistic view that the gender pay gap for more recent college graduates will stay small and even be made to shrink under conditions where policy and practice are advancing toward increasing equity. Or should one instead take the pessimistic view that the gap will gradually increase for these younger members of the workforce, repeating the earnings disparities characteristic of their elders, most of whom presumably earned their bachelor’s degrees decades ago? And if the gender pay gap contracts, will it do so because median earnings for women catch up to men’s even as median earnings for men increase? Or will the gap contract because median earnings for men continue to deteriorate? The ACS data have allowed analysts to reveal correlations among major field of baccalaureate study, occupation, and earnings. But how directly applicable are these reports to students who are working toward a bachelor’s degree now? The findings about the career paths and earnings histories of more experienced workers who earned degrees two, three, or more decades ago reach us today, but does the information we receive reveal more about conditions prevailing today or, like light from a distant star, about those prevailing at the point in the past when the majors were completed and the degrees conferred? The release of these new reports creates an occasion to consider how the ACS data and the series of Georgetown Center reports based on them have focused public attention on earnings as a measure of the relative educational value of different fields of study, sometimes the leading or even sole measure considered worth attention. On the positive side, the Humanities Indicators reports and the Georgetown Center reports all show that graduates who take bachelor’s degrees in the humanities find employment, often in occupations whose social value needs to be reemphasized, not denigrated. The lower earnings these occupations have historically yielded should not be allowed to define their relative worth or the worth of the fields of study that characteristically serve as pathways to them. A capacious view of these data on occupations, earnings, gender, and college majors will push beyond their face value and lead us to ask important questions about how the social and economic arrangements behind them have come about. The links among gender, field of study, occupation, and earnings have powerful implications for public policy and broader social change that will create better, more equitable arrangements. This entry was posted in Bachelor's degrees, Careers, Earnings, Occupations on November 17, 2015 by David Laurence. Insistent questions about the risks, costs, and value of graduate study in the humanities offer a forcible reminder that we know far less than we ought about the long-term career progress and employment outcomes for people who earn PhDs in language and literature. Good data about where graduates end up ten or twenty years after completing their degree programs have been especially scarce since the mid-1990s, when the humanities lost participation in the federally sponsored Survey of Doctorate Recipients (SDR). Begun in 1973 and still administered biennially for engineering and the physical, biological, and health sciences, the SDR follows a sample of individuals who hold research doctorates from universities in the United States from the year of their degree award until age seventy-six. This past year, with support of a grant from the Andrew W. Mellon Foundation, the MLA Office of Research took a step toward filling the gap in our knowledge that the loss of the SDR created. Using Internet searches for public information, the project sought to identify the employment status and occupations in 2013–14 of a random sample of 2,590 graduates. The sample was drawn from a universe of 1996–2011 PhD recipients with Dissertation Abstracts International records in the MLA International Bibliography. Of the 2,590 PhD recipients in the sample, we succeeded in locating 2,286. The final analysis excluded records of 72 individuals whose degrees are in engineering or computer science (these dissertations are covered in the bibliography because they reflect work on speech recognition or similar kinds of language-related computer science and engineering projects), giving us a sample of 2,214 PhD recipients.1 Although the MLA sample is too small to be regarded as representative, findings from the study offer useful indications about the diversity of careers followed by people who receive PhDs in English, other modern languages, and related fields. In the Spring 2015 MLA Newsletter, MLA Executive Director Rosemary G. Feal describes the basic findings of the MLA’s study, summarized in figure 1. As of 2013–14, of the PhDs whose employment we were able to identify, about half held positions as tenured or tenure-track faculty members or as deans, provosts, or presidents (who presumably hold tenure in their institutions). 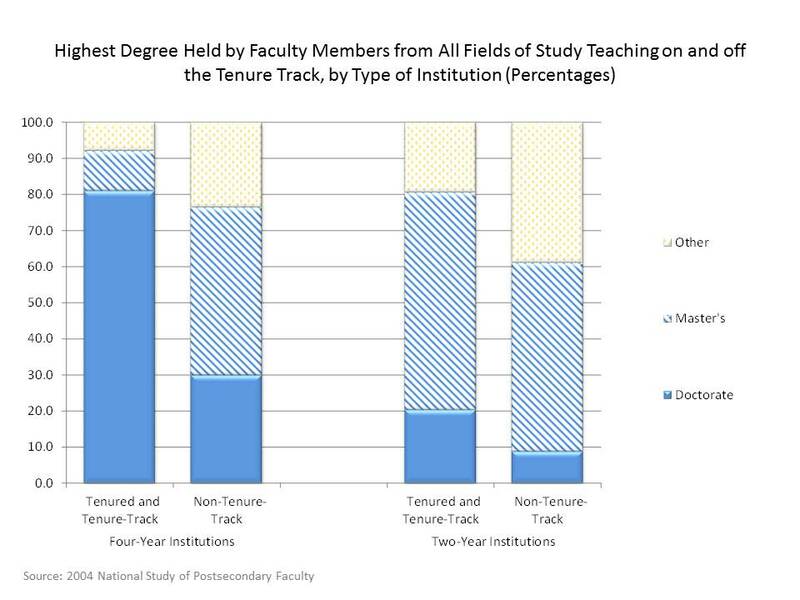 Just over twenty percent are higher education faculty members teaching off the tenure track (this figure includes graduates whose tenure status we were unable to determine). Some six percent are higher education professionals working beyond the classroom in “alt-ac” positions. Over a fifth are working outside postsecondary education, in business, government, or not-for-profit organizations (7.5%) or in secondary and elementary schools (3.2%) or are self-employed (10.7%)—about the same proportion as are teaching in non-tenure-track positions in higher education. Breaking the distribution down by the year when graduates received their degrees reveals that the percentage working in postsecondary education is highest among more recent graduates (over 80%), whereas the percentage employed in the so-called BGN sector (business, government, and not-for-profit organizations) rises from more recent to earlier degree recipients—from 13.9% for the group who received the PhD after 2004 to 20.0% for those who completed degree programs between 1996 and 1999 (table 1). Unfortunately, the data summarized in table 1 cannot tell us whether the pattern reveals a cohort effect unique to each temporal group or a temporal effect likely to repeat itself as recent graduates move forward in their careers. The limitation underscores the need to gather information directly from graduates about their experiences and career paths and progress after leaving graduate school. Analysis illuminates how the subgroup of doctorate recipients working in higher education in the United States is distributed across the different types of institutions. Looking at the distribution by institutional control reveals that 60.6% are working in public institutions and 37.8% in private not-for-profit institutions (fig. 3). Approaching the data by Carnegie classification shows that research/doctoral universities employ the plurality of the subgroup (44.6%), followed by master’s universities (28.8%), baccalaureate colleges (14.0%), and associate’s colleges (9.4%) (fig. 4). 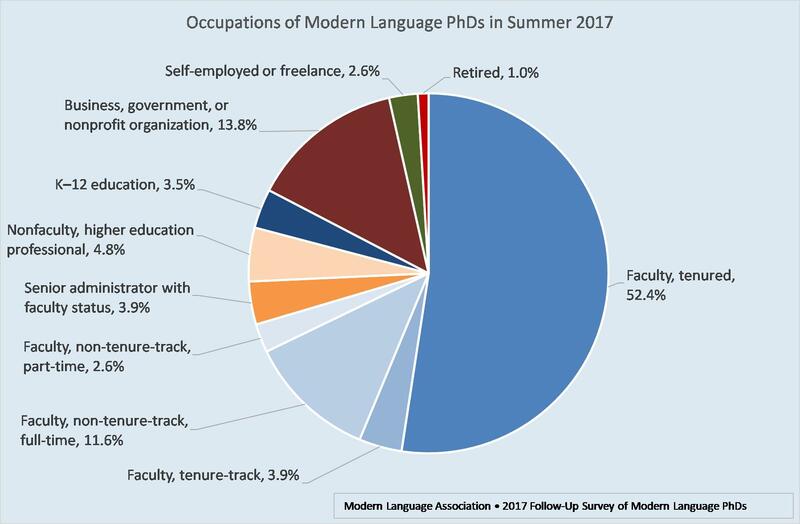 The large share of modern language PhDs working in doctorate-granting research universities may come as a surprise to some readers, given the widespread impression that few jobs in postsecondary education, especially faculty positions, are located in research universities. The common impression, however, confuses the distribution of institutions with the distribution of faculty positions across the institutions. 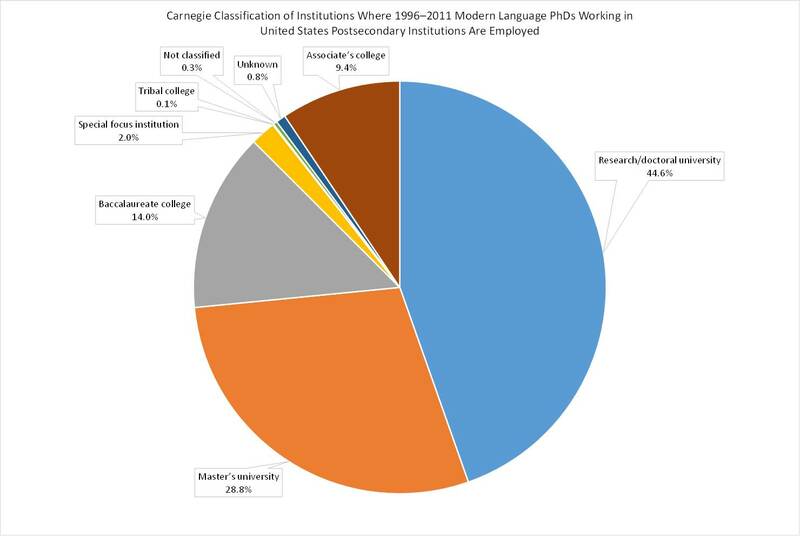 Carnegie research/doctoral institutions make up less than 9.0% of all public and private not-for-profit institutions in the United States that provided information in fall 2013 for the Employees by Assigned Position Survey (EAP), one of the human resources components of the United States Department of Education’s data collection system for higher education. But those institutions are large, employing upward of 30% of all nonmedical faculty members and close to 45% of all full-time, nonmedical tenured and tenure-track faculty members. 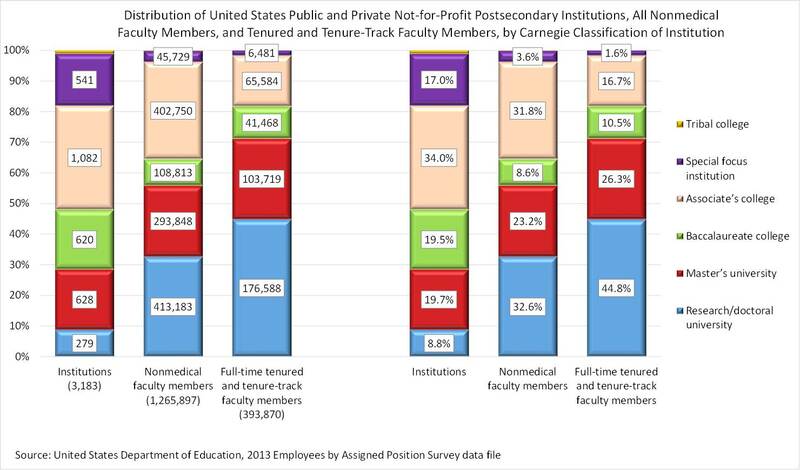 Figure 5 shows a breakdown of institutions by Carnegie classification alongside a breakdown of the nonmedical faculty members and the full-time, nonmedical tenured and tenure-track faculty members the institutions employ, as reported in fall 2013 on the EAP. That said, as the figure shows, the majority of faculty positions are located in master’s universities and baccalaureate and associate’s colleges. Cross-tabulating the type of institution where members of this subgroup are working by the type of position they hold offers some additional informative detail. (The number of cases becomes very small outside the four main Carnegie types [research/doctoral and master’s universities and baccalaureate and associate’s colleges] and the two main kinds of institutional control [public and private not-for-profit], so findings for those other categories should be treated with caution.) Breaking out the different types of positions PhDs hold by the control of the institution where they work reveals that the percentages of PhDs in different types of positions varies only modestly between public and private not-for-profit institutions—about two-thirds are tenured or tenure-track faculty members, and just over a fifth hold non-tenure-track faculty positions (table 2). A slightly higher percentage of PhDs in private not-for-profit institutions than in public institutions holds positions as senior administrators—4.0% compared with 2.5%. And the private not-for-profit sector has a slightly higher percentage working as higher education professionals beyond the faculty and classroom—8.6% compared with 7.0%. More striking differences appear in the breakdown of types of positions PhDs hold by the Carnegie classification of institutions where they work (table 3). Only 14.0% of the subgroup employed in higher education in the United States is working in baccalaureate colleges, but 78.4% of them hold a tenured or tenure-track faculty position and 12.4% hold a non-tenure-track faculty position. The breakdown is similar for the 28.8% working in master’s universities, where 76.1% hold tenured or tenure-track faculty positions and 14.7% hold non-tenure-track faculty positions. By contrast, of the large subset of PhDs working in research/doctoral universities (44.6%), a far lower 61.4% hold a tenured or tenure-track position and a far higher 26.2% hold a non-tenure-track faculty position. Professional positions beyond the faculty and classroom are most prevalent at research/doctoral universities—10.9% of the PhDs working in research/doctoral universities hold such positions—and perhaps in special focus institutions, where 11.5% are working as professionals beyond the classroom; however, the number of cases from special focus institutions (26) is very small as a basis for generalization. Senior administrators appear with greatest frequency among the PhDs working in associate’s colleges—9.7% hold posts as senior administrators, compared with 4.3% of the PhDs in baccalaureate colleges, 3.2% of those in master’s universities, and only 1.4% of those in research/doctoral universities. Unsurprisingly, given the high percentage of non-tenure-track faculty members in associate’s institutions, only 42.5% of the PhDs working in associate’s colleges hold tenured or tenure-track faculty positions, whereas 42.7% are teaching as non-tenure-track faculty members. Findings from this MLA project suggest the strong orientation toward careers in higher education of people who hold a doctorate in modern languages, literatures, and related fields; 77.0% of the PhDs in our sample whose employment we were able to discover hold positions in a postsecondary institution. But the findings also suggest the variety of roles and occupations these PhDs have found inside and beyond the postsecondary faculty and classroom and inside and beyond higher education. As an outside view based on public information gathered by the MLA, the study affords insight that is necessarily limited. That we were able to identify only a single unemployed PhD, for example, seems more a reflection of the nonpublic character of that category than an indication of the unemployment rate among humanities PhDs. And an outside view affords next to no insight into PhDs who regard themselves as underemployed, wanting full-time positions but employed part-time. 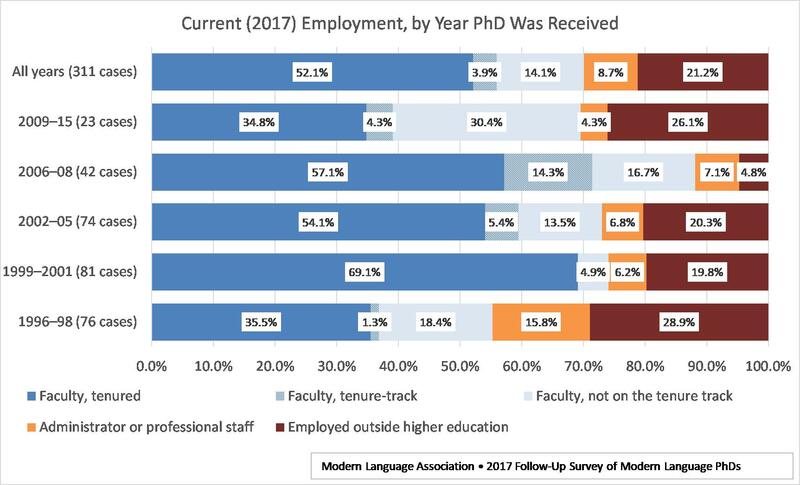 Despite the study’s limitations, the findings do tell us that, overwhelmingly, language and literature PhDs find professional employment, often beyond teaching as a tenured or tenure-track faculty member. The forms of professional success PhDs find are varied. Doctoral programs and their students need to be able to embrace success in the full variety of occupations where graduates in fact find it. The American Historical Association conducted a similar study, also with support from the Mellon Foundation, results of which are available in a report by L. Maren Wood and Robert B. Townsend, The Many Careers of History PhDs. There are eleven graduates included in calculations for figure 1 who are not included in the calculations for figure 2 because the location of their institution could not be determined, hence the base number and percentages in figure 1 differ slightly from those in figure 2. This entry was posted in Uncategorized on February 17, 2015 by David Laurence. 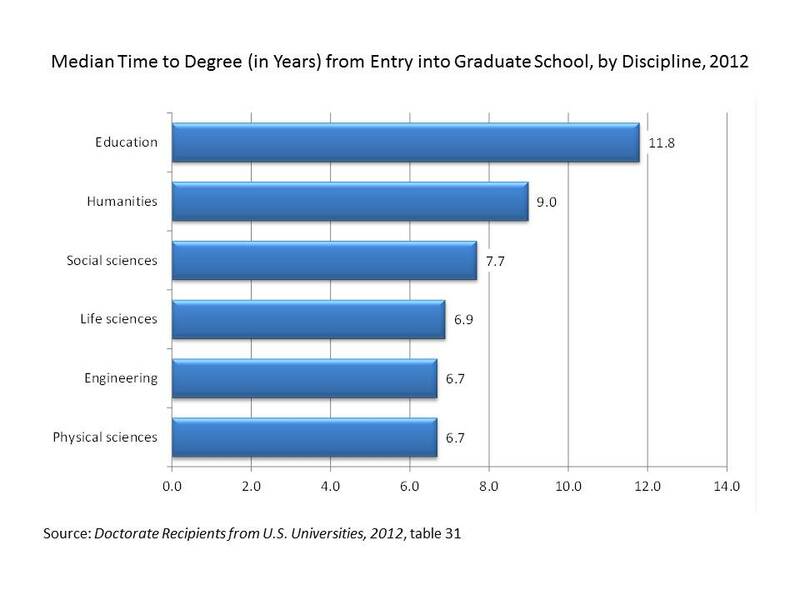 The road to a PhD in a humanities discipline is long—for graduates who completed degrees in 2012, 9.0 years long, the median time from first entry into graduate school to receipt of the degree (Doctorate Recipients, table 31). That nine-year median is not just long in itself; it is significantly longer than the median for 2012 graduates in social sciences (7.7 years), life sciences (6.9 years), physical sciences (6.7 years), and engineering (6.7 years). Only 2012 graduates in education, with a median 11.8 years to degree, take more time to complete their degree programs than graduates in the humanities. 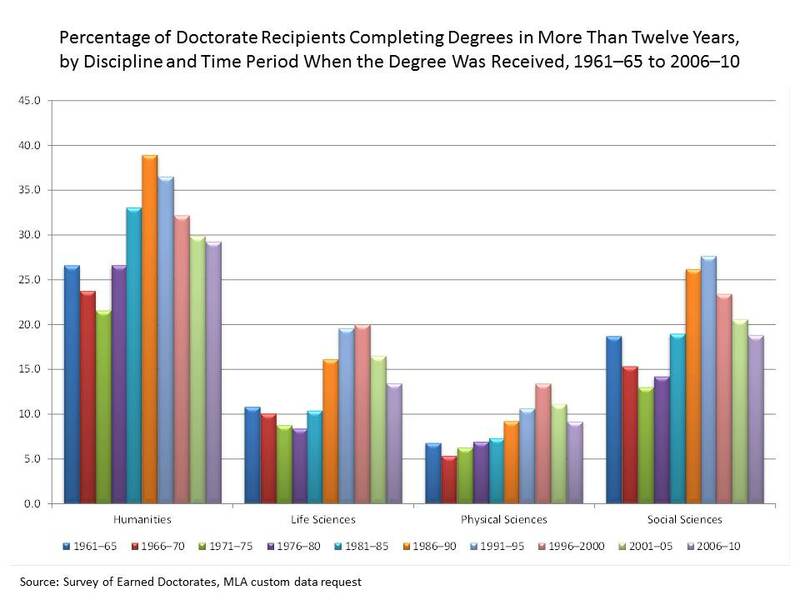 As long as a nine-year path to the PhD may be, the class of 2012 humanities degree recipients took less time than any classes since the 1970s. The 2012 median of 9.0 years is notably shorter than the 9.5 years recorded by humanities graduates who received degrees over the five years 2006–10, and it is strikingly shorter than the record-high 10.7-year median for graduates who received humanities degrees between 1986 and 1990. (The median for 2011 graduates was 9.3 years, in case you were wondering.) 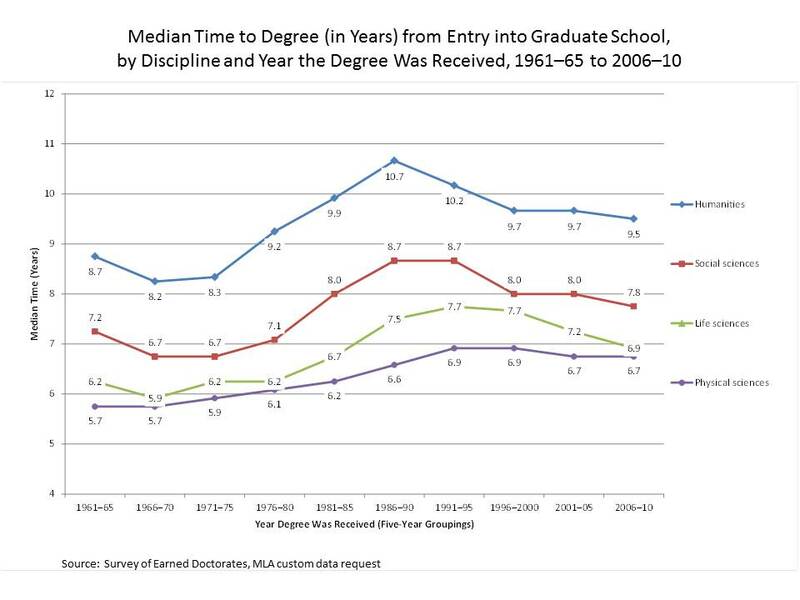 In fact, since 1990, median time to degree (measured from year of entry into graduate school) has been falling across the disciplines. Figure 1 shows the history of time to degree in the four broad disciplinary areas of the arts and sciences over the fifty years from 1961 to 2010. The source is a custom report that NORC, the Survey of Earned Doctorates (SED) contractor, developed for the MLA from the raw SED data on time to degree from 1961 to 2010. The custom report grouped degree recipients into ten five-year clusters—1961–65, 1966–70, 1971–75, and so on to 2006–10—breaking out five major disciplinary fields (humanities, social sciences, physical sciences, life sciences, and engineering) and, within the humanities, three SED subfields (history, foreign languages and literatures, and American and English literature). Progress to the degree lengthened across all the arts and sciences disciplines during the 1970s and 1980s. 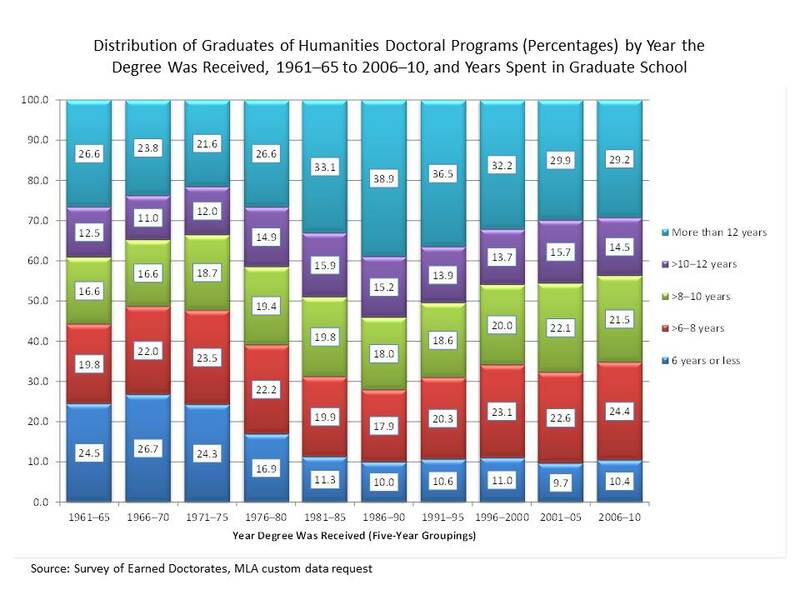 But it lengthened most for graduates in the humanities. 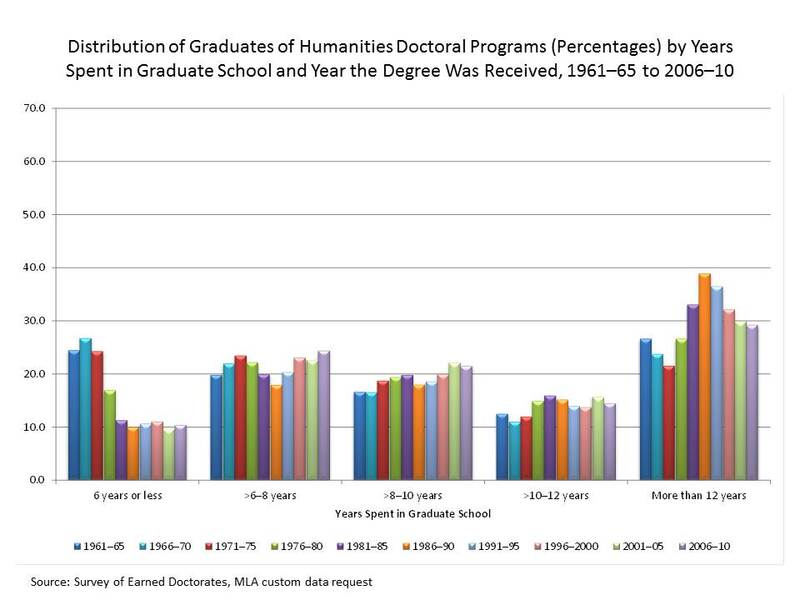 Graduates who received humanities PhDs between 1986 and 1990 spent 2.5 years more in graduate school than humanities graduates who completed degrees two decades earlier, between 1966 and 1970. 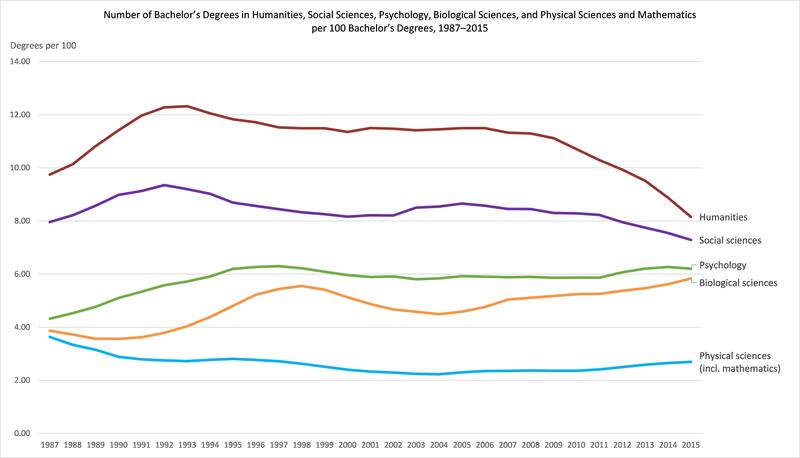 And humanities PhDs who received degrees between 1986 and 1990 spent over four years more in graduate school than their 1986–90 counterparts in the physical sciences, three years more than those in the life sciences, and two years more than those in the social sciences. As of 2012, the most recent year for which SED data are available, the gap between the humanities and other disciplines is smaller but remains substantial: over a year longer for humanities PhD recipients than for PhD recipients in the social sciences and over two years longer than for graduates in the life sciences and the physical sciences (fig. 2). How one views these data on time to degree will vary, depending on what one thinks the data reveal about the risks and opportunity costs of attempting to enter the academic profession. Do we think time is an abundant or a scarce resource for students in their twenties and early thirties? Do we think it unreasonable to expect graduate students to invest a decade of a working lifetime and life span to earn a PhD? That preprofessional pressures for graduate students to publish would operate to lengthen time to degree I take as axiomatic. The same period, 1970 to 1990, was also notable for a rising bar for tenure and promotion and increased demands for publication that motivated a transformation of the tenure-track assistant professor position, especially in doctorate-granting research universities. The work and life of faculty members on probationary appointments changed from what had been a distinctly junior status quite sharply differentiated from the privileged standing tenured professors enjoyed. As the job crisis in the 1970s made assistant professor positions scarce, it also made them more privileged and protected, more like than unlike the senior professorial ranks in the conditions of their work. It became common for university departments with graduate programs to limit the exposure of their assistant professors to committee and other service obligations. Assistant professors came to have the same (lighter) teaching load as their tenured seniors, the same or sometimes even greater access to research leave, and the same exemption from teaching the required composition course and other introductory courses. For actors on all sides—whether graduate students or faculty members in their dual roles as advisers to graduate students and members of search committees making hiring decisions—the sense that the bar for earning tenure was getting higher likewise worked to raise the bar for entry to a tenure-track position. To be competitive, graduate students afforded themselves the time to make the entry ticket of the dissertation as close as possible to a monograph manuscript ready for the publisher. The downward trend in time to degree since 1990 is every bit as interesting as the prior upward trend—and may be more of a challenge to understand. Certainly, around 1990 time to degree and the closely related matters of attrition and completion rates emerged as prominent topics in the policy discussion around the economics of doctoral education. In Pursuit of the PhD, William G. Bowen and Neil L. Rudenstine’s 1992 follow-up to the 1989 Prospects for Faculty in the Arts and Sciences, by Bowen and Julie Ann Sosa, brought renewed attention to the economic issues in doctoral education—of high costs to universities, high opportunity costs to students, and questions about the investments (and returns on investment) of fellowship programs like those sponsored by the Danforth Foundation and the Woodrow Wilson National Fellowship Foundation. The Graduate Education Initiative that the Andrew W. Mellon Foundation undertook through the 1990s explicitly made shorter time to degree a prime objective and called attention to long time to degree and high noncompletion rates as problems graduate education needed to address (Ehrenberg, Zuckerman, Groen, and Brucker). More recently, the Council of Graduate Schools’ PhD Completion Project reflects and amplifies the concerns administrators and funders have expressed about the large investments of time and resources doctoral study has typically demanded from both the students who undertake it and the institutions that sponsor it. The data suggest that these discussions and initiatives may have had an effect. A median summarizes a distribution with an equal number of values higher and lower than the single median number. 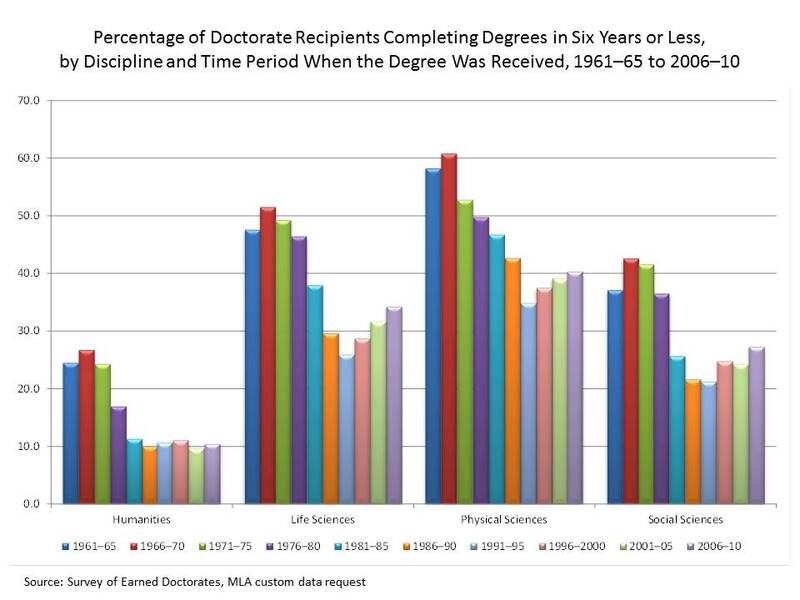 As part of the MLA’s request for historical data on time to degree, the office of research asked NORC to develop frequency distributions detailing the number of graduates who took differing amounts of time, from six years or less to more than thirteen years. The distributions behind the medians turn out to be illuminating. As shown in figure 3 and figure 4 (in which the distributions have been aggregated to show time to degree in five groupings from six years or less to more than twelve years), the medians mask the real locus of action over the past fifty years, which has been at the extremes of shortest and longest times spent in graduate school. In the first three five-year temporal groups—1961–65, 1966–70, and 1971–75—a quarter of humanities graduates took six years or less to complete their degree programs—about the same portion that took more than twelve years. From the 1980s forward, the segment taking six years or less dropped to 10%, while the segment taking more than twelve years expanded to almost 40%, falling back to just under 30% from 2000 on. Figure 4 shows the same information but groups degree recipients across the ten time periods together according to the number of years they spent in graduate school. As figure 4 may reveal most clearly, over the fifty years the biggest changes were a pronounced drop after 1975 in the percentage of humanities graduates who took six years or less to complete their degrees and a corresponding increase in the percentage taking more than twelve years. Changes over time in the three middle groups were modest by comparison. Interestingly, a pattern almost identical to the humanities is evident across the disciplines. The life sciences, physical sciences, and social sciences, however, start in the 1960s with far higher percentages of graduates finishing in six years or less and end in the 2000s with far lower percentages taking more than twelve years to complete their degrees (fig. 5 and fig. 6). A review of the history and historical trends still leaves us to grapple with the question of direction for the future. Figure 7 focuses attention on the 2006–10 group of program graduates and compares the disciplines by the percentage of those that had the shortest and longest time in graduate school. The figure reveals the large and even startling disparity between the humanities and the other arts and sciences fields. The percentage of 2006–10 graduates completing degrees in six years or less (the green bars) is three to four times greater in the sciences, engineering, and social sciences than in the humanities. 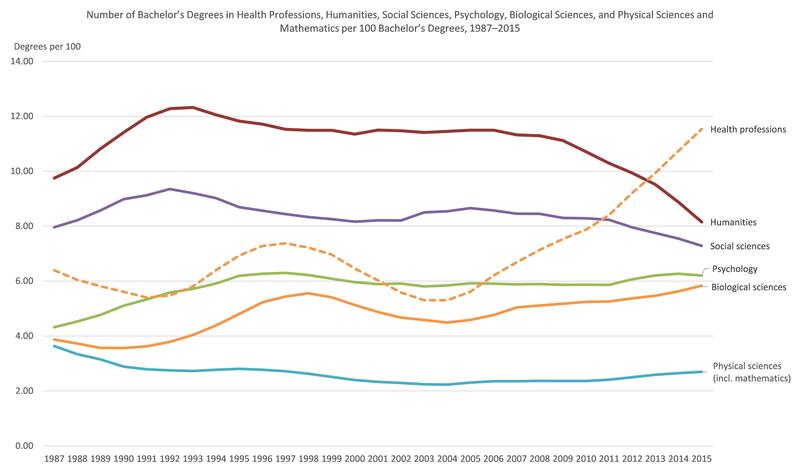 And the percentage of 2006–10 humanities graduates taking more than ten years to earn a PhD (the red bars) is more than double the percentage in the sciences and engineering and 1.5 times the percentage in the social sciences. Circumstances where, whether by choice or necessity, 40% of a field’s PhD recipients end up taking more than a decade to earn their degrees seem unsustainable. Shrinking the surprisingly large group of degree recipients in language and literature who take an inordinately long time seems imperative. On the other hand, when thinking about practical measures to respond to this imperative, we need to recognize how the data hide individual histories, with their complex mix of circumstances. There is much we would wish to know and understand that these data do not and cannot tell us. As students pass beyond a fourth or fifth year, how do they support their graduate studies? If they are self-funding five or six years or more of doctoral education, how is lengthy time to degree intersecting with the troubled state of academic labor and the adjunct academic workforce? The data do, nonetheless, remind us forcibly why it is important for local programs to keep track of doctoral candidates and their progress to the degree. Bowen, William G., and Neil L. Rudenstine. In Pursuit of the PhD. Princeton: Princeton UP, 1992. Print. Bowen, William G., and Julie Ann Sosa. Prospects for Faculty in the Arts and Sciences: A Study of Factors Affecting Demand and Supply, 1987 to 2012. Princeton: Princeton UP, 1989. Print. Doctorate Recipients from U.S. Universities, 2012. National Science Foundation. Natl. Science Foundation, Jan. 2014. Web. 9 May 2014. Ehrenberg, Ronald G., Harriet Zuckerman, Jeffrey A. Groen, and Sharon M. Brucker. Educating Scholars: Doctoral Education in the Humanities. Princeton: Princeton UP, 2009. Print. Guillory, John. “Preprofessionalism: What Graduate Students Want.” ADE Bulletin 113 (1996): 4–8. Web. 9 May 2014. This entry was posted in Graduate study and tagged PhD time to degree on May 14, 2014 by David Laurence. The shrinking share of the faculty workforce with tenure or eligibility to earn tenure is well known and, among those in the academic community at least, widely deplored. Even in four-year colleges and universities, the percentage of faculty members holding full-time tenured or tenure-track appointments has dropped from 51.3% in 1995 to just 33.4% in 2011 (US Dept. of Educ., Fall Staff Survey data files). It is often assumed or asserted that the growth of the non-tenure-track academic workforce, and especially the corps of part-time teachers who form the largest and most vulnerable part of that workforce, has been more or less the direct result of the hypertrophy of a doctoral education system that has permitted or even promoted a self-destructive overproduction of PhDs far in excess of the number for whom higher education can provide tenure-track opportunities. The implications and consequences for our PhD employment problem of the emergence of a majority non-tenure-track academic workforce, however, are less straightforward than may at first appear. I focus on four-year institutions, since that is the sector of higher education on which doctoral students most set their sights. Of course, as noted above, data for the faculty as a whole leave in darkness what’s happening at the level of the disciplines. Still, it is useful to remind ourselves that the evidence does not support claims of a wholesale abandonment of tenure across four-year postsecondary institutions. 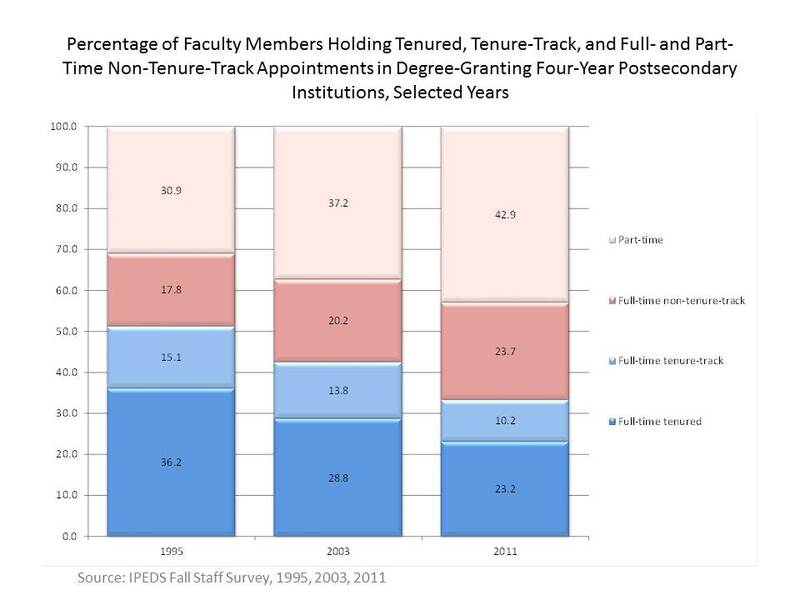 But, then, over the same period since 1995, the Fall Staff Survey documents gigantic increases in the number of non-tenure-track and especially part-time faculty members (fig. 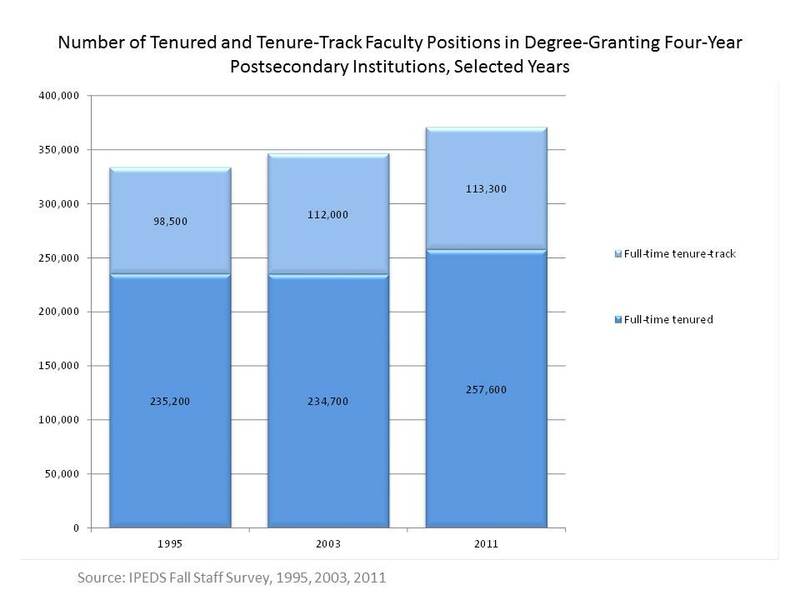 2), compared with which the modest growth in tenured and tenure-track positions amounts to practically no growth. 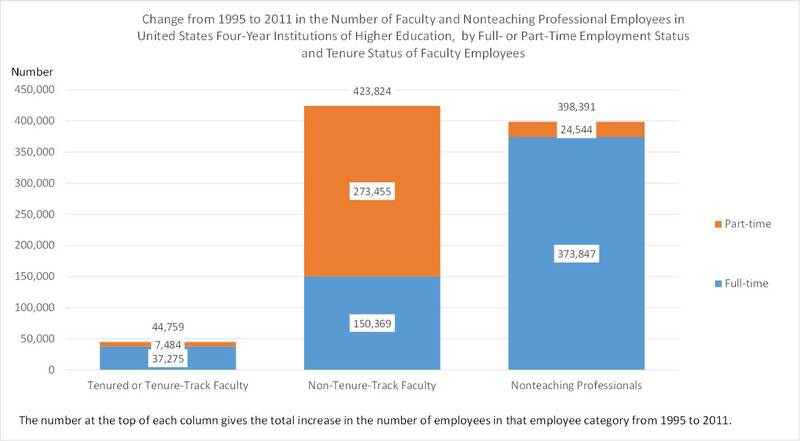 Looking at the numerical quantities side by side—as shown in figure 4—makes clear how the institutional demographics have altered since 1995, so that in the aggregate, even in four-year institutions, the part-time academic workforce has come to far outnumber the tenured and tenure-track faculty. Putting these pieces together, adding data on student enrollments, and including two- as well as four-year institutions, we see in figure 5 a higher education system in the midst of profound demographic change. Since just 1995, the student population—the blue line—has grown 1.5 times. The faculty population—the orange dots—has grown about 1.6 times. But over 90% of the increase in the size of the faculty has come in the form of non-tenure-track positions—the red diamonds. By comparison, the tenured and tenure-track segment of the faculty—the green squares—has seen zero population growth. According to NSOPF:04, a doctorate is the highest degree held by only 30% of the full- and part-time faculty members teaching off the tenure track in a four-year institution and by a small percentage of all faculty members teaching in a two-year college, whether on or off the tenure track. Overall, as estimated from NSOPF:04, less than a quarter of the faculty population employed off the tenure track holds a doctorate; most hold a master’s degree. Across the disciplines, a master’s degree is clearly the standard degree qualification for teaching in the first two years of college, whether those first two years occur in a two-year or a four-year institution. The pattern is even more pronounced in the humanities (fig. 7), where NSOPF:04 shows well over 90% of tenured and tenure-track faculty members teaching in a four-year institution hold a doctorate, compared with just over 30% of humanities faculty members teaching full- or part-time off the tenure track. A doctorate is unquestionably the standard degree qualification for holding a tenured or tenure-track faculty appointment in a humanities discipline in a four-year college or university, whereas a master’s degree is standard for teaching off the tenure track or in a two-year college. Since 2000, humanities doctoral programs in United States universities have awarded approximately 5,000 to 5,500 degrees each year. Across all disciplines, doctoral programs have awarded about 50,000 new doctorates annually over the same period (SED). Meanwhile, master’s degrees number well over ten times that 50,000. In 2003 there were over 500,000; in 2011 over 700,000. Humanities master’s degrees numbered over 14,000 in 2011, up from just over 11,000 a decade ago (IPEDS completions component). Insofar as our PhD employment problem has a connection to higher education’s increasing reliance on non-tenure-track positions, the connection has much more to do with institutions expanding the labor pool from which they draw their teaching faculty in the face of an expanding undergraduate student population than with doctoral programs producing an oversupply of PhDs. As a response to the growth of the non-tenure-track academic workforce, at least, the prescription to cut the production of PhDs would seem to be aiming the wrong medicine at the wrong target. The question remains, however, whether the doctoral education enterprise needs to shrink, given the doctoral program attrition rate of 31% that Ronald Ehrenberg and Harriet Zuckerman report in Educating Scholars (172), their study of programs that participated in the Andrew W. Mellon Foundation’s Graduate Education Initiative, and the ten-year noncompletion rates of up to 50% among humanities doctoral students that the Council of Graduate Schools reports from its PhD Completion Project. 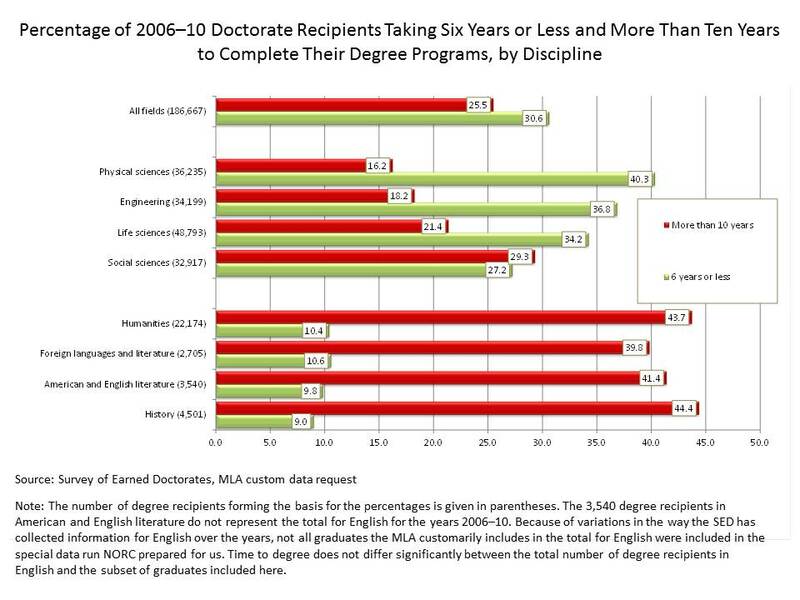 If those who leave doctoral programs without receiving a PhD (not to mention those working as graduate student teaching assistants or adjuncts while enrolled) are as much a part of the labor pool from which postsecondary education draws its teaching staff as those who complete the degree, the solution would seem to lie in reducing doctoral program enrollments rather than the number of PhD recipients per se. But doctoral candidates who leave PhD programs with a master’s degree form only a subset of students who receive master’s degrees, whether from departments where a doctorate or a master’s degree is the highest degree offered (IPEDS completions component). The paradox seems to be that master’s degree programs, which have occupational outcomes other than college teaching as their stated purpose, have in practice long placed a significant subset of graduates to (non-tenure-track, especially part-time) postsecondary teaching positions, while PhD programs, which have preparation for a professorial career as their stated purpose, have in practice long had a significant subset of their graduates go on to occupations other than postsecondary teaching. Agreeing to the proposition that a measure of PhD population control would be a good thing still leaves unaddressed key questions of what the target number should be and why, which subspecialties to target and why, and how in practical terms the system of doctoral programs moves from here to there. In departments’ hiring to tenure-track positions, subspecialization comes to the fore. Fortunately, as I expect most would agree, no central mechanism exists to mandate the number of applicants programs may admit; the field specializations doctoral candidates will be permitted to follow; or the closely linked determinations of the topics, authors, works, and periods departmental curricula and degree programs will cover. Far from relieving programs of responsibility, the local and decentralized character of these decisions places both the authority to determine appropriate program size and the responsibility to take account of the realities of placement squarely on departments and their faculties. First, there was the mere fact of sitting in the same room with others from the Berkeley English department and talking openly, as a group, about careers besides college teaching, breaking the taboo that reigns among many graduate students on this topic. I felt immediately less isolated. . . . By talking about other kinds of work, we turned down the brightness of the holy aura surrounding academic work. We considered the possibility that other work can be rewarding in similar ways. To me, that sounds like the right prescription for how doctoral programs and their students can think productively about life after graduate school, irrespective of what the placement statistics say or whether the paths graduate students explore lead them to careers as tenured faculty members or positions in postsecondary administration, secondary school teaching, government agencies, for-profit enterprises, not-for-profit organizations, or the many other professional occupations where doctorate recipients have made and will continue to make their livelihoods. The conversation about career paths and possibilities for humanities PhDs has recently gained new life in discussions at the MLA and AHA annual conventions and in projects like the AHA’s Malleable PhD, the MLA’s Task Force on Doctoral Study in Modern Language and Literature, and the Public Fellows program of the American Council of Learned Societies. Promising and important as these projects are, most crucial will be faculty members and graduate students finding the courage to speak up in their home departments. It’s way past time to break the taboo enforcing the academic career as the sole placement option that can be publicly acknowledged and discussed. We need to make a start now toward naturalizing a larger, more generous view of employment possibilities and career success in graduate education. This entry was posted in Academic workforce, Graduate study, PhD placement on March 11, 2014 by David Laurence. More on That Northwestern Study: The Authors Speak, but Is Anyone Listening?